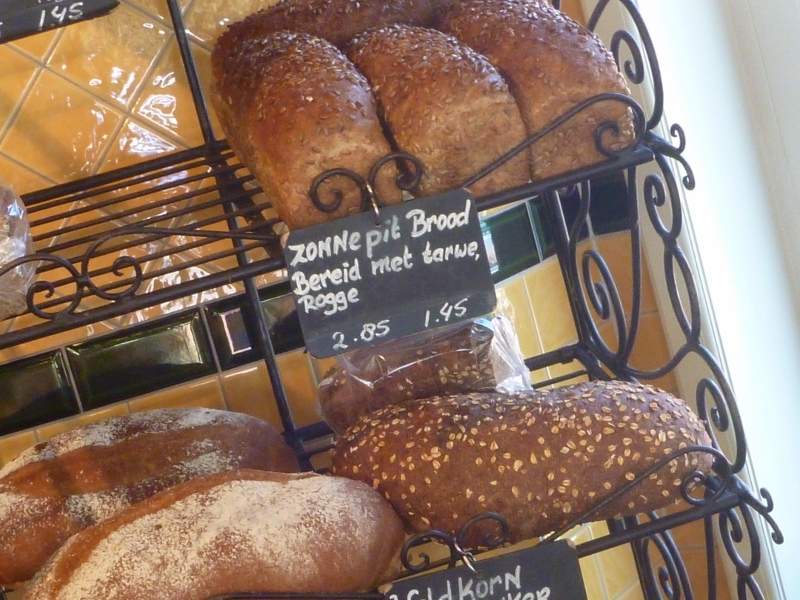 During our tour we had covered all 11 Dutch provinces pretty well, with one exception. We had not actually been to Friesland, the province in the mid-north of the Netherlands. It is another rather rural and flat part of the country, but different in many ways. 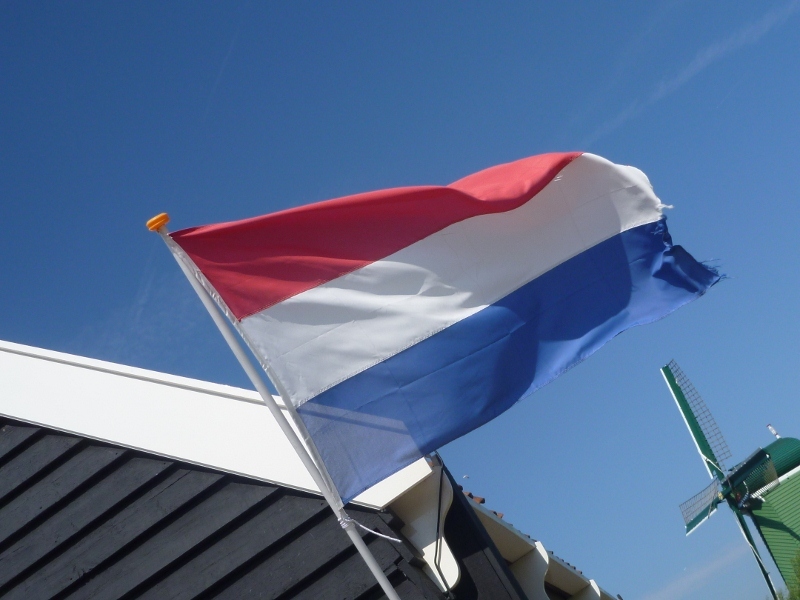 The people speak a language, which is similar to Dutch, but it is a language on its own. They play a sport called ‘Kaatsen’, which is unknown anywhere else, but they are also very keen ice-skaters like all Dutch people. Whenever the ice is strong enough, they organise an ice-skating race of 240 km around 11 main towns in Friesland, called the ‘Elf-steden-tocht. Due to global warming the race is not often contested these days, but people still either do an alternative race in Austria of the same distance or there is an option to do the route by bicycle. We didn’t have time to do another 240 km ride, but after a few days off we were itchy to do some more riding. Also, we still had a Eurail pass with some unused days, so we decided to take the bikes by train to Friesland. We found out that the train trip alone would take more than two hours each way, but there was an alternative. The train could take us to Enkhuizen (already visited on our North Holland tour) and from there we could take a ferry across the IJsselmeer to Stavoren in Friesland. We had to be at Amsterdam Central station by 7 am to catch the train, so off we went in the dark. 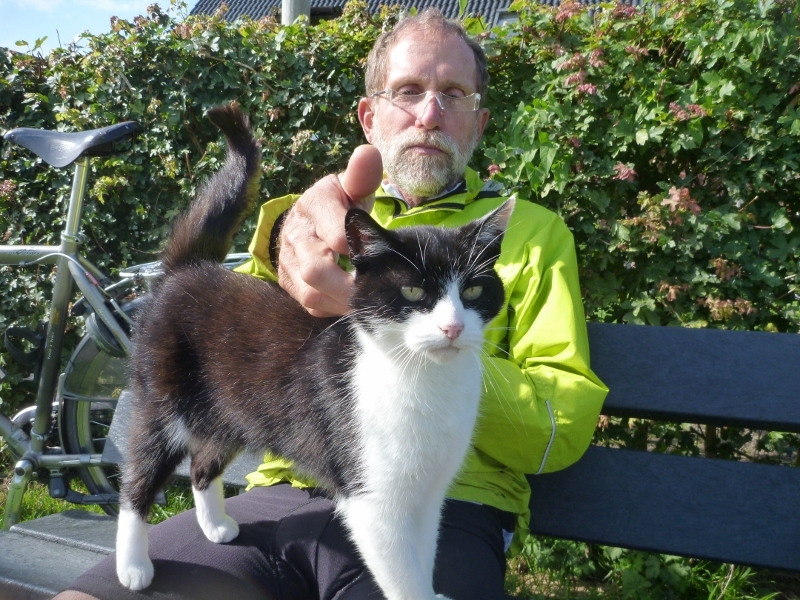 At Enkhuizen we were joined by a large group of cyclists who were planning to go around the Ijsselmeer via the ‘Afsluitdijk’, a 34 km dike which had turned the large bay into a lake in 1933. 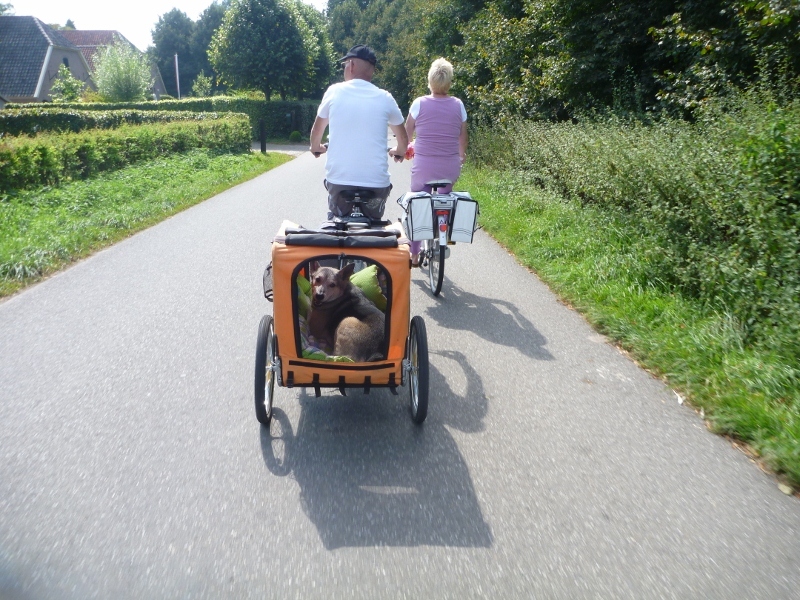 We decided to leave them to it, because it would take us back into North Holland where we had already been and their road bikes were too fast for us. We took it easy and had a good look at some of the historic places such as Stavoren and Hindelopen and worked our way up the west coast of Friesland up to Harlingen with mainly nice tail-winds. From there we turned East and reached Franeker. In Franeker is a house, where Eise Eisinga between 1774 and 1781 built a huge ‘Planetarium’ in his living room. 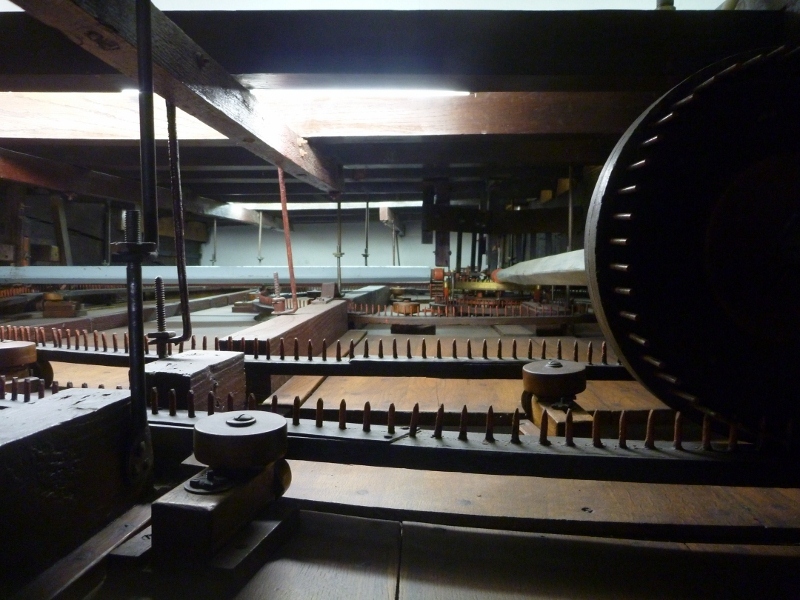 It models the positions of all the then-known planets accurately through a system of a single pendulum driving an enormous clockwork of gears with more than 10000 hand-made nails. It even shows phases of the moon and displays times and dates accurately and still does that now. For further details, here is a link: Eise Eisinga Planetarium. We spent a lot of time in the museum, which has now been set up in the house, because this is indeed a fascinating piece of engineering with an amazing history. After a cup of coffee at the cafe next door we came out in the street to see and hear a street organ play ‘happy birthday’ to one of the old patrons. 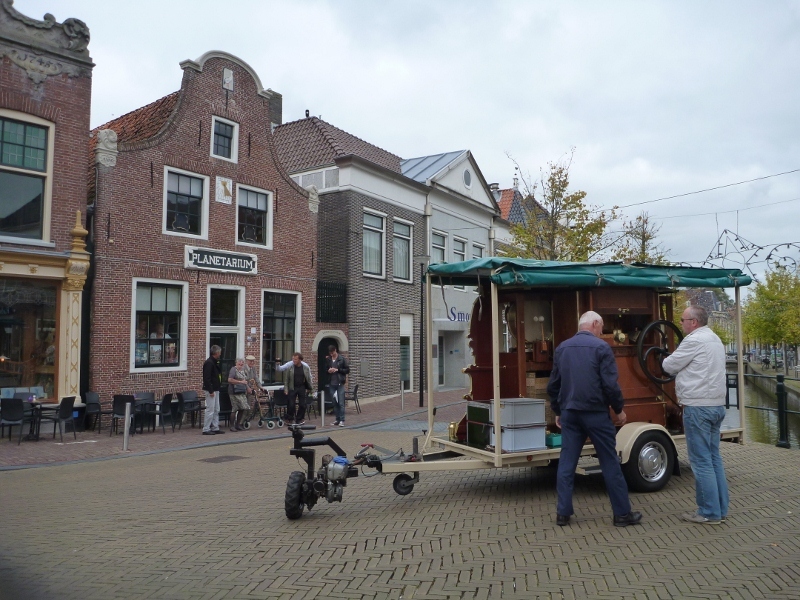 [This street organ can be seen and heard at the end of the North Holland video]. Then it was time to find the railway station and return to Amsterdam to farewell the family and pack up for the flight home. And now? 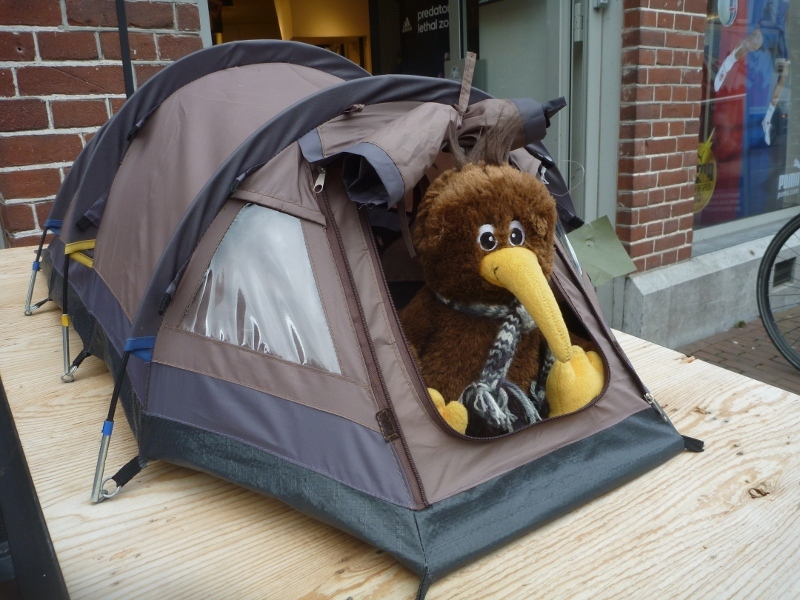 Yes, we have safely arrived home again in Auckland. 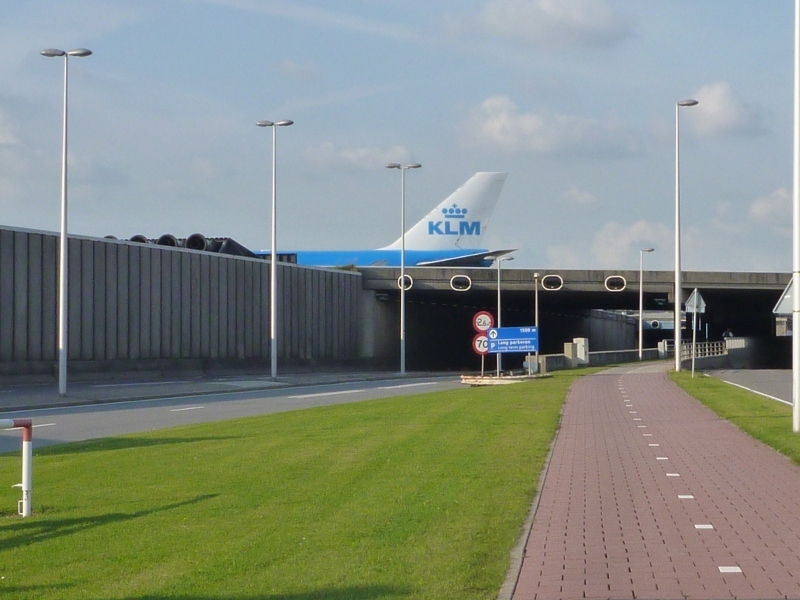 Of course the journey from our Amsterdam base to the airport was an adventure in itself. We missed one train, switched to an overloaded subway tram and then on a Schiphol train in peak-hour with one bike-in-a-bag and another to be packed in a huge KLM box at the airport, plus a full suitcase. We spare you the details of the Airbus flights with two rather heavy landings and the joy (?) of a hotel in crowded Dubai, 4 hours sleep and a buffet breakfast. 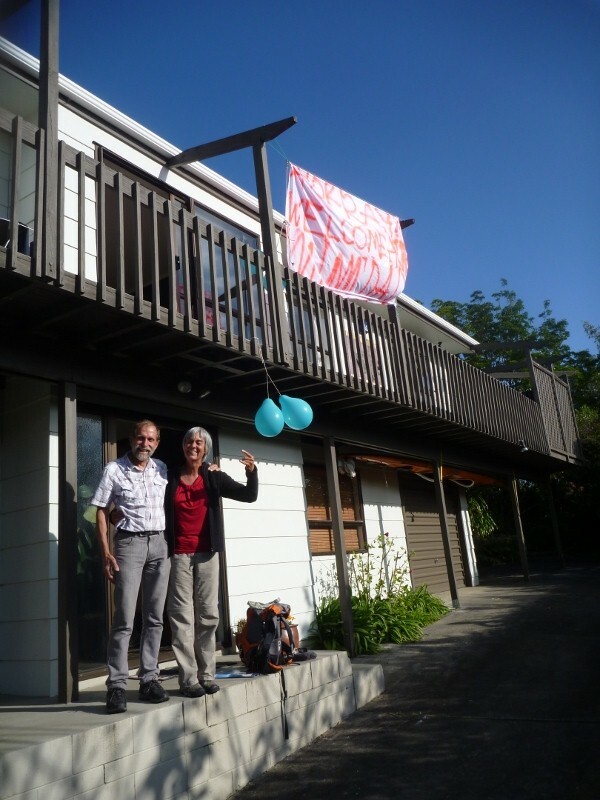 We arrived home to find that the home front had balloons out and a banner with ‘Welcome Home, Mum and Dad’. The house was clean and stocked up with food. Thanks to all involved! Also thanks to all you supporters who kept following us on this blog. Your encouragement helped us to keep going on several occasions. We may have missed some of the best parts of this ‘trip of a lifetime’, if we had decided to give up or turn south, when the weather forecast for north was not so good. Please contact us, if you think we can help you with your plans. Don’t underestimate what you can undertake, when you put you mind to it. The rest of the Dutch Dunes trip. The VOC or Verenigde Oostindische Companie sailed its tall ships from Amsterdam and other harbours along the Zuiderzee in the 1600s and 1700s. They sailed to the ‘East Indies’ including Indonesia, Singapore, Malaysia and other countries to bring back spices, tea and other delicacies. The Zuiderzee was then a large bay protected by a string of Islands on the north coast of Holland where these tall ships could offload their booty in places like Hoorn, Enkhuizen en Medemblik. These places still show the richness of the East Indies traders who built their warehouses, shops and estates there. Many of those old buildings are still standing today or have been carefully restored or rebuilt. The harbours were also used for fisheries who sailed the Zuiderzee and the North Sea with flat-bottom vessels called Tjalks and Botters. The flat bottoms of these boats allowed these ships to also navigate the extensive mudflats in these areas and therefore have instead of keels an adjustable board on each side, like centreboards but not in the middle, which function as keels depending on the way the ship is listing. Quite a number of these boats are still sailing here and others have been rebuilt or built from previous plans from combinations of old and new materials. So, a lot of the old history can still be seen here, but conditions have changed a lot. A 32 kilometer dike now protects the old Zuiderzee, now called Ijsselmeer from storms and spring tides. Large ships can no longer enter the bay, but a canal from the North Sea to Amsterdam has ensured that Amsterdam has maintained its status of a world harbour. Regularly the tall ships get together there to revive the glory of yesterdays sailing in spectacular displays. 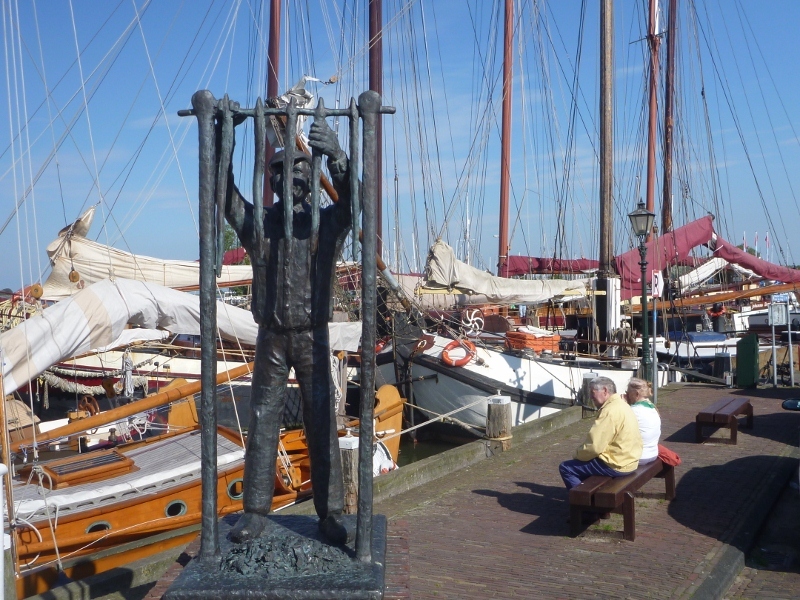 The old VOC towns on the Ijsselmeer still do some fishing, mainly for eels and flat-fish, but the flat-bottom boats are now used for tourism by providing an impressive sight for onlookers or an old-fashioned sailing experience for people who like the smell of salt, rope and tar. About 40 percent of the old bay has now been reclaimed and a combination of causeways and dikes has created sheltered watersport, fishing and bathing areas. We followed the old dike along the east side of the Ijsselmeer today and particularly had a good look at the harbours of Hoorn and Enkhuizen. 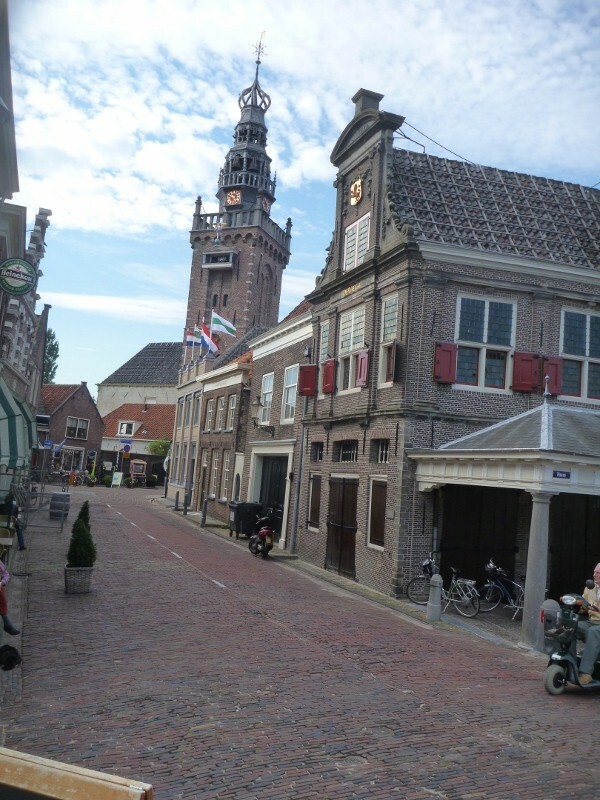 This was not the first time we had been here, because in 1997 we had taken the kids to the Zuiderzee museum in Enhuizen where they wore the old tradional outfits and played traditional games like stiltwalking and hoops. From there we had sailed with them to Hoorn and saw a fleet of Tjalks sailing past. Now, there are even more of these ships and the harbours have grown to accommodate large fleets of contemporary yachts in their marinas as well. We had a great day cycling the coast here along dikes with nicely tar-sealed cycleways and traditional cobblestone streets in beautiful weather, be it with some head-wind. For the record we biked 75 kilometers on this day. Today we left Geuzenbuurt camping. There were a few fresh mole mounds near the tent and I suspect there was one running around thinking it might be able to party with Pai during the night! They are very elusive and the closest we have got to seeing one are the few that are dead along the cycle paths. 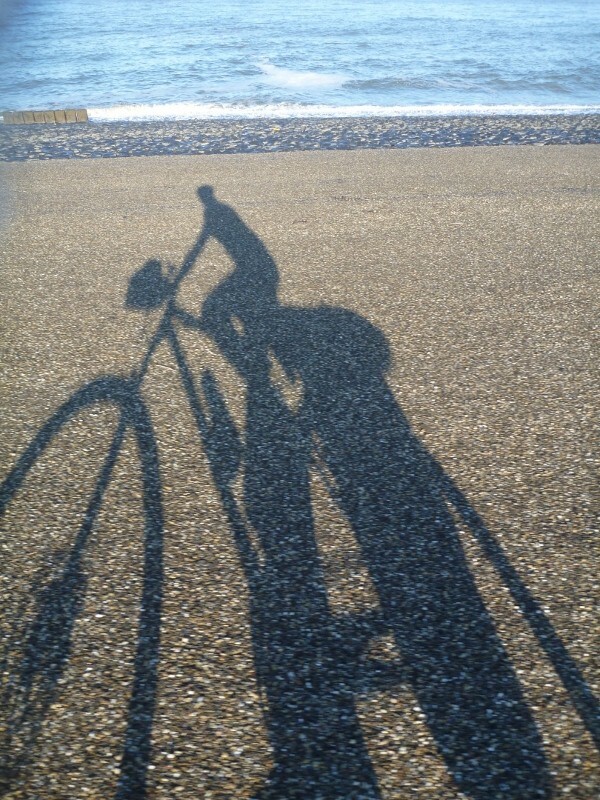 We continued along the coast in nice dry sunny weather. We turned inland when we had got to Opperdoes and crossed over more farming areas. The villages up here are very traditional and it is nice to ride through them. Often we stop for a coffee in the morning and have a wander around them. At Middenmeer we stopped for coffee and the village had been ‘bombed’ by knitters. 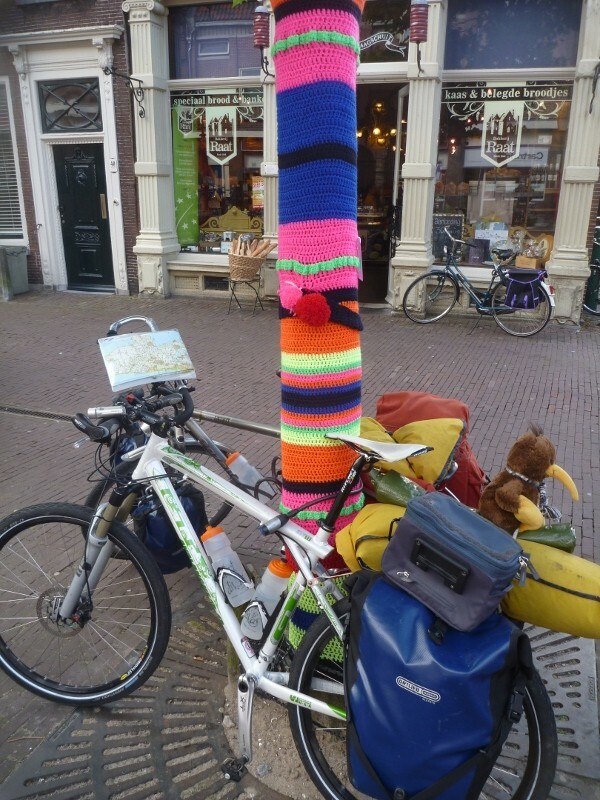 All the lamp posts and other fixtures were covered in knitted panels. 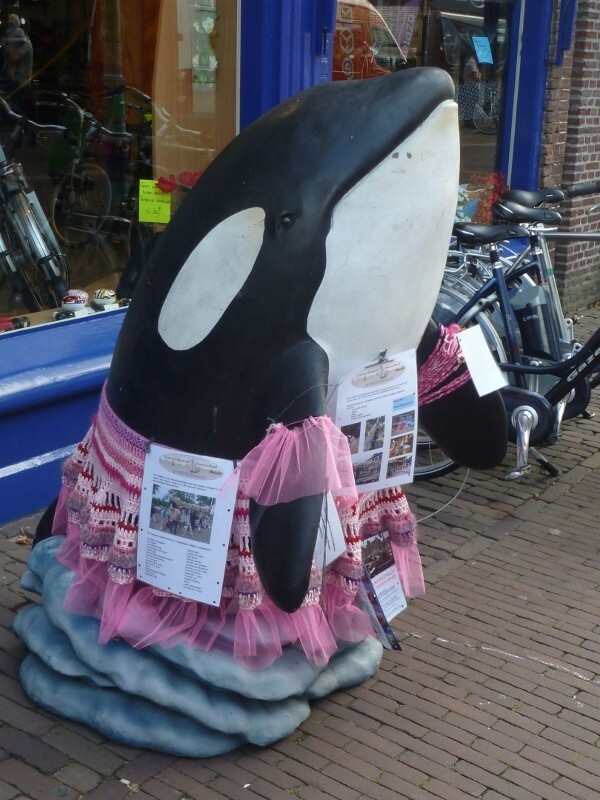 Even an orca statue had been dressed up. It was a colourful atmosphere right through the place. The cafe we stopped at had been decorated with paintings all over it’s walls and ceilings and was across the road from an old tobacco factory built in 1878. The front of this building was quite impressive with it’s nice facade. 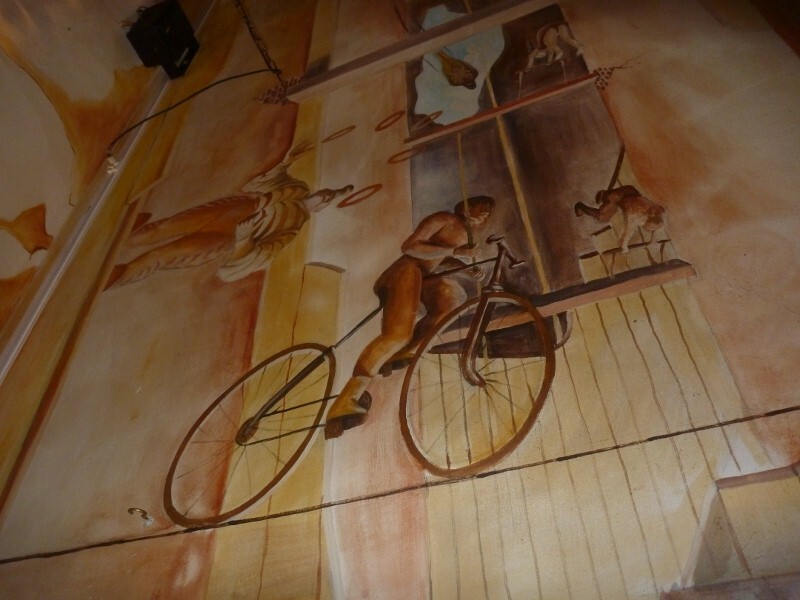 Part of the fresco on the roof of the cafe. As we wandered around here we stopped outside a camping shop to photograph Pai inside a tent on display. It was just the right size for him! Pai inside the tent we found that was just the right size for him! By early afternoon we had reached Den Helder and preparing to cross over to the island of Texel. This is a small island famous for it’s sheep. The island is a very interesting place. We found many small communities with a couple of larger towns to support them with shops etc. 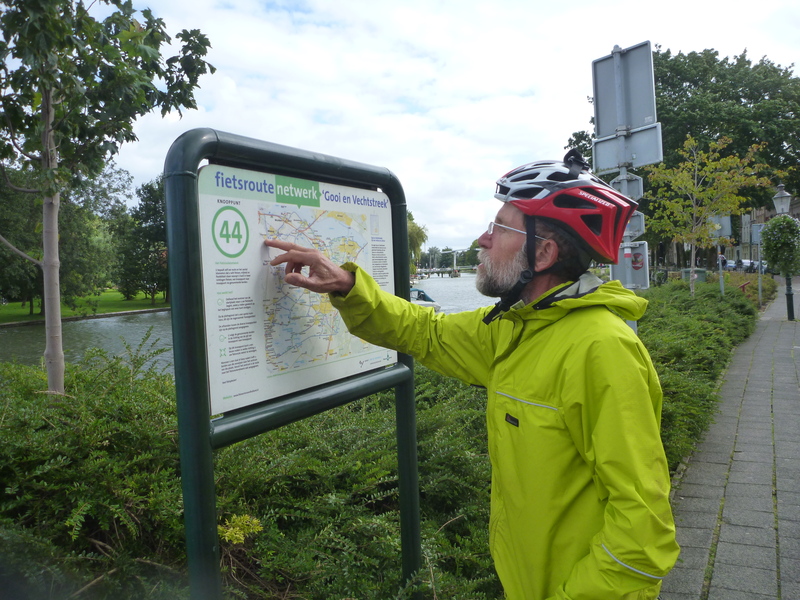 We rode up the east side with a short diversion to Den Burg, the biggest town. We found a nice farmers camping for the night just out of De Cocksdorp. They had cattle which are kept in a large barn all year round. The majority of their land is used to grow the grass and maize that is fed to the cattle twice a day and to have for camping guests. The island seems to be relying on agriculture and tourism for its economic support. It is a very popular camping area if prices are anything to go by. The larger camping grounds demanding over 30 euros for a tent site for the night. 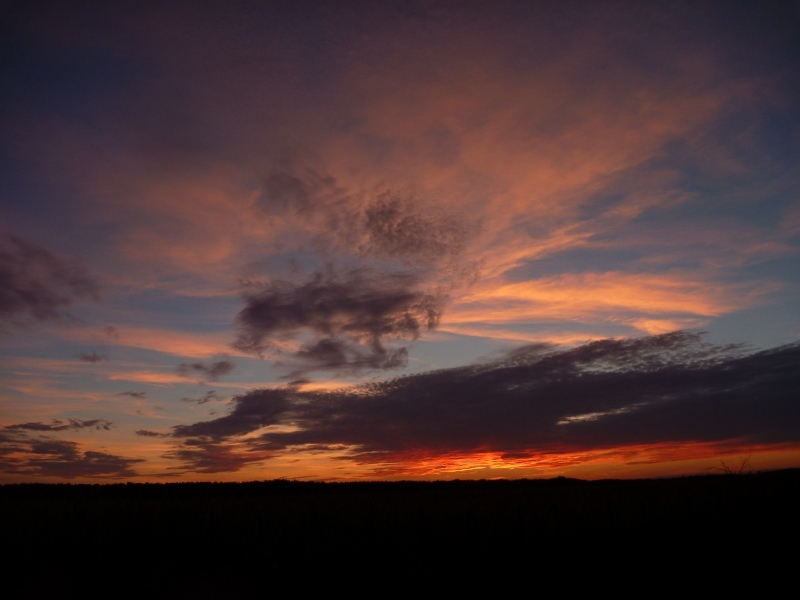 We watched the sun go down in a blaze of colour before tucking into the sleeping bags. We woke to a dry day but plenty of wind not from a very favorable direction! 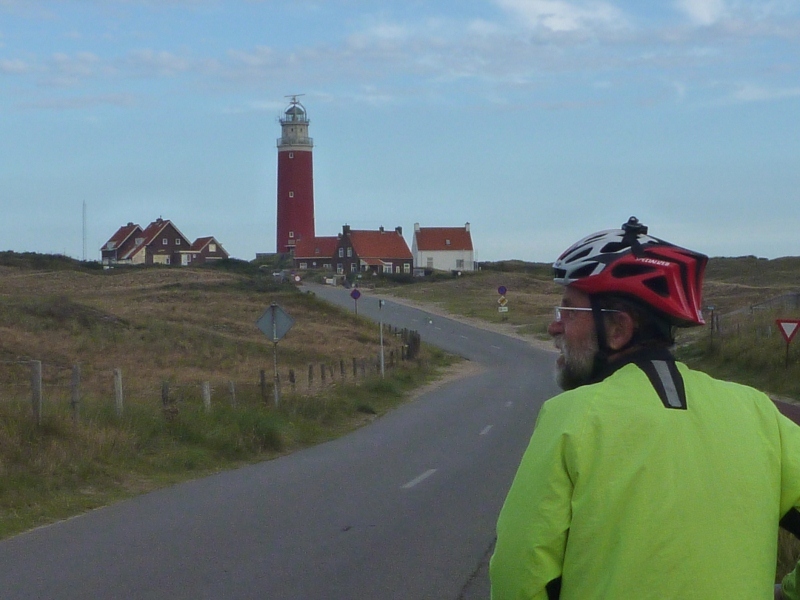 We first rode up to the very top of the island and looked at the lighthouse before turning south and starting back towards Amsterdam. The way back for us is down the east coast of the island which takes us through the dunes. These are very similar to what we have ridden through in Denmark. It has been a nice change to have a bit of undulating land to ride through. By the time we got to the ferry terminal for the return to the mainland the boat was just getting ready to leave – perfect timing. There was an amazing amount of cars waiting to board so people obviously go over quite a lot. We met a couple from California who had hired bikes for a trip around similar to ours. They were doing it the opposite way. 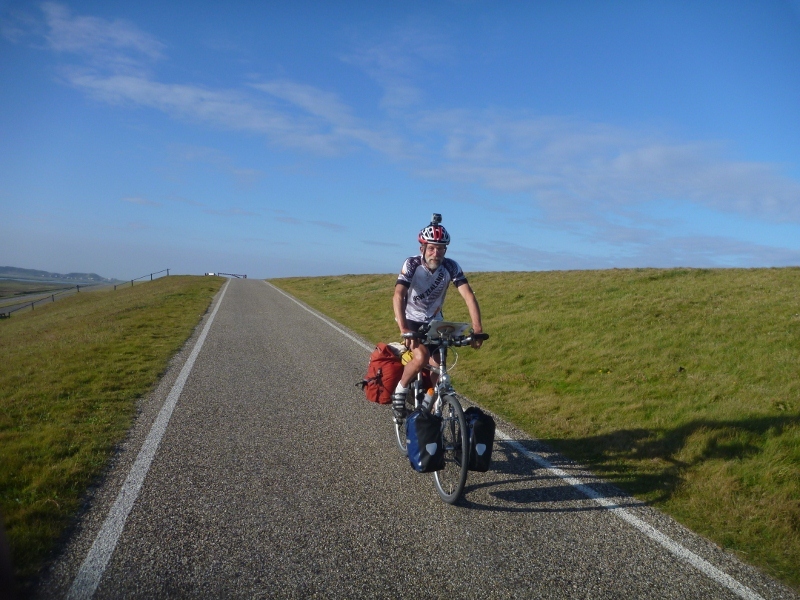 We had a tough ride into the wind from Den Helder but once we turned to directly south it was a bit easier. We continued to ride through the dunes with stops along the way for coffee and lunch. 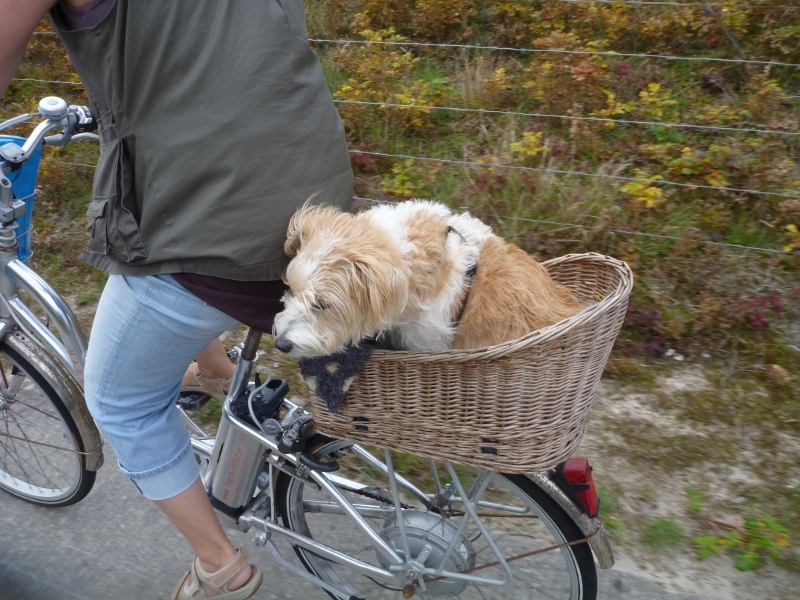 Every man and his dog was heading for the beach…. The sun has been out so much lately that there are many people out on their bikes enjoying the fine weather. We are spending the night at a camping ground just south of St. Maartens. When we first enquired about cost for camping the price was 27 euros but we made it clear that would be too much for us. We decided to get a plate of chips at the snack bar before moving on and during the time we were getting into those the receptionist came over to say she could accommodate us for 17.85 euros if we wanted to stay. This is much more in line with what we expected so we are now going off to cook dinner and put the tent up! Today has dawned a fine sunny day and we continue our travels along the south coast. Being a Saturday here it is quite busy with lots of people taking advantage of some predicted late summer weekend of hot temperatures. We have taken a bit of a side path inland through Bergen and stumbled apon a village market. It has been set up in the middle of town around a ruined church. 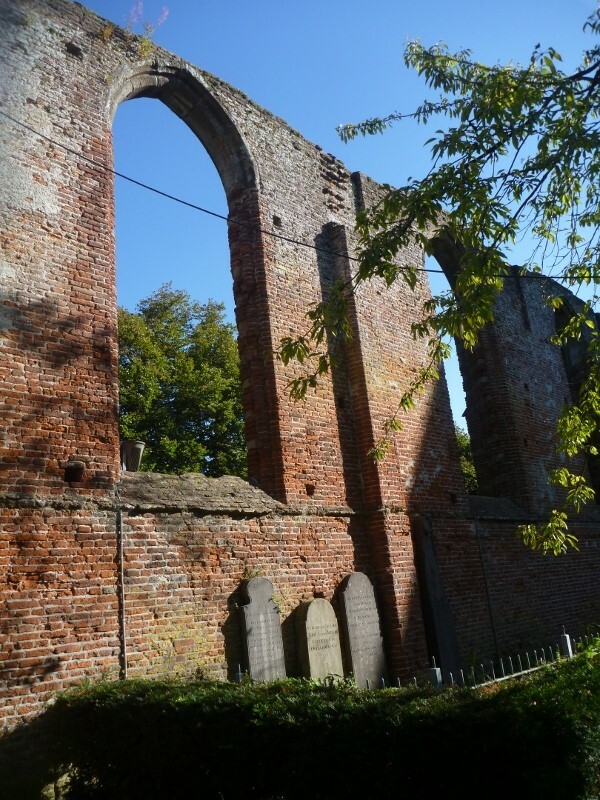 The original church was built around 1200 and attacked and ruined but several people have made attempts to restore various parts of it. At present it appears to have a front part with an altar and a house built into the rear which is now basically a museum and information kiosk. There are signs of romanesque architecture in the old parts that are still standing. While wandering through the market we found the closest imitation of the norwegian Statoil buns! They were triangular buns with chocolate chips – not quite as good as the norwegian ones but good hunger busters! Part of the ruined walls of the church in Bergen. After leaving Bergen we continued south east to Alkmaar. This is an old town that thrived in the past on the cheese industry. In the center of the town is the old cheese auction house that on Fridays comes alive with a traditional cheese market in the cobbled square next to it. The building is beautiful and features wonderful pieces of art and sculptures. It was a busy place which has large numbers of terrace cafes that were well patronised. The top part of the front of the cheese auction house that featured wonderful sculptural parts and paintings. 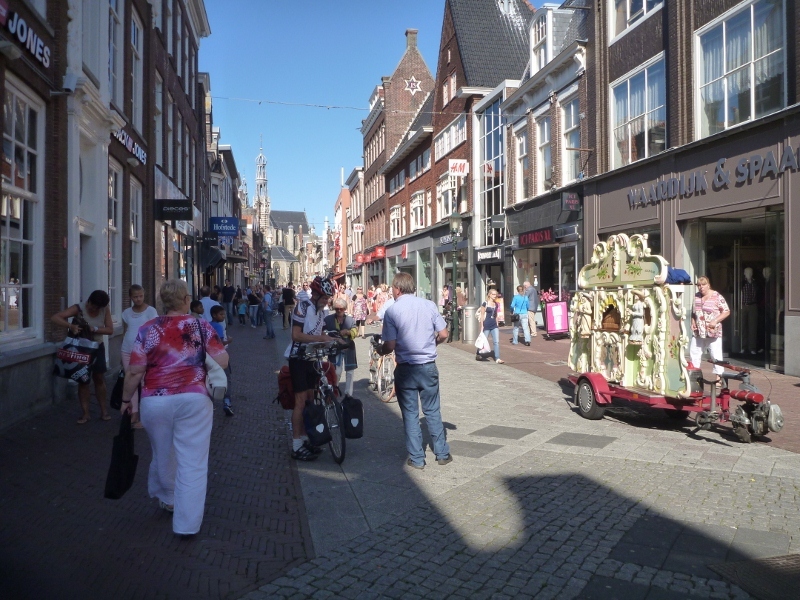 Street organ in the main street of Alkmaar. The town was a hive of activities. 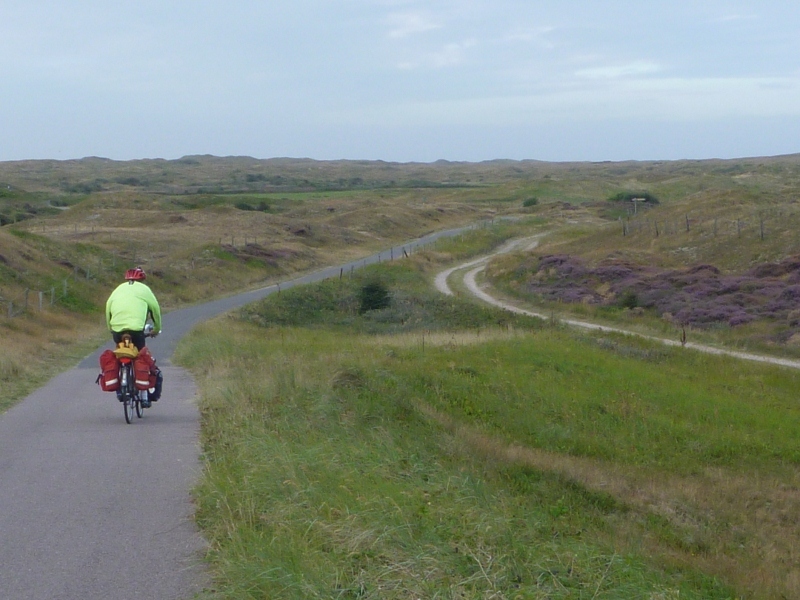 After leaving Alkmaar we headed back out to the dunes via Egmond aan Zee. 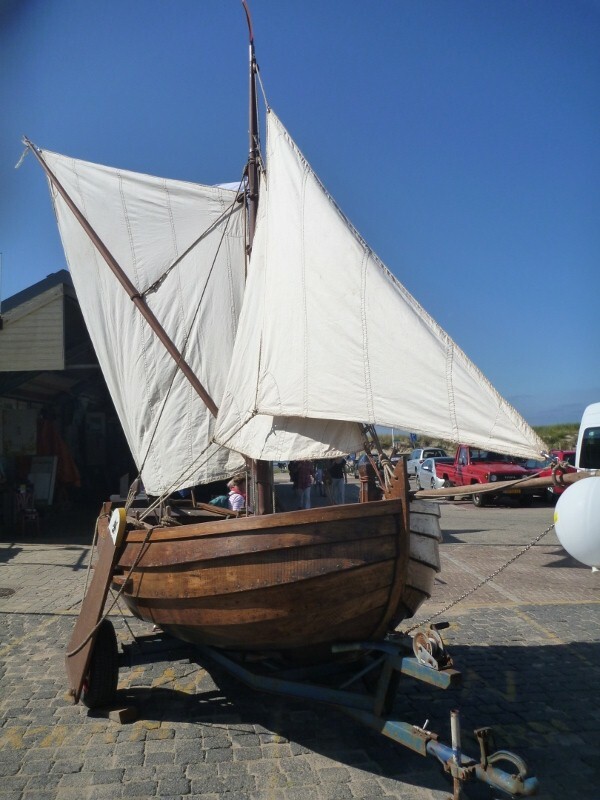 There the local historians had a display of an old fishing boat ‘Pinck’. It was a replica built from the original drawings of the boat that was wrecked not far from here. A big solid boat constructed by hand from Oak. Not far from the museum there was a sculpture of a rescue boat sitting in the dunes below the light house. A nice piece next to the cycle path. Along this coast of Holland there are many lighthouses and like Denmark, the seas have claimed many lives. We frequently come across the memorials to the rescue crews and there are still many locations where the coastal rescue services have their bases. We continued through the dunes to Wijk aan Zee and found a small camping that is run by volunteers who are members of a cooperative style camping set up, called NIVO. When we arrived we were offered a cup of coffee and we sat and chatted about our travels etc. Eric was a fanatical aircraft buff and he had great pleasure in showing us the photos and application he had on his I Pad for following all the planes over Holland. We had a lot of fun with these people and enjoyed staying at their small camping area. Today is another one out of the fine weather box – not a cloud in the sky! 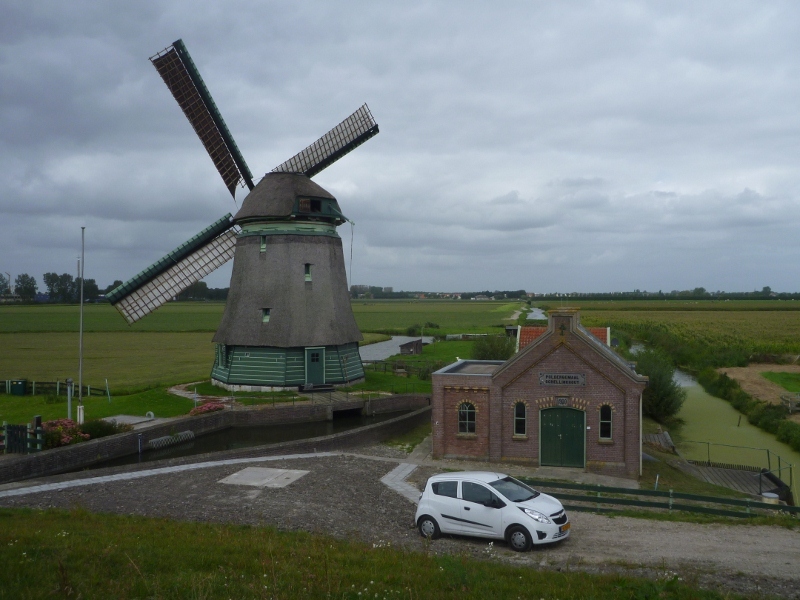 We headed south out of Wijk aan Zee with the aim of crossing the North Sea Canal to Ijmuiden but when we reached the crossing point we needed to phone a ferry (water taxi) so we retraced our route back and went via the outskirts of Beverwijk to cross over at the locks. 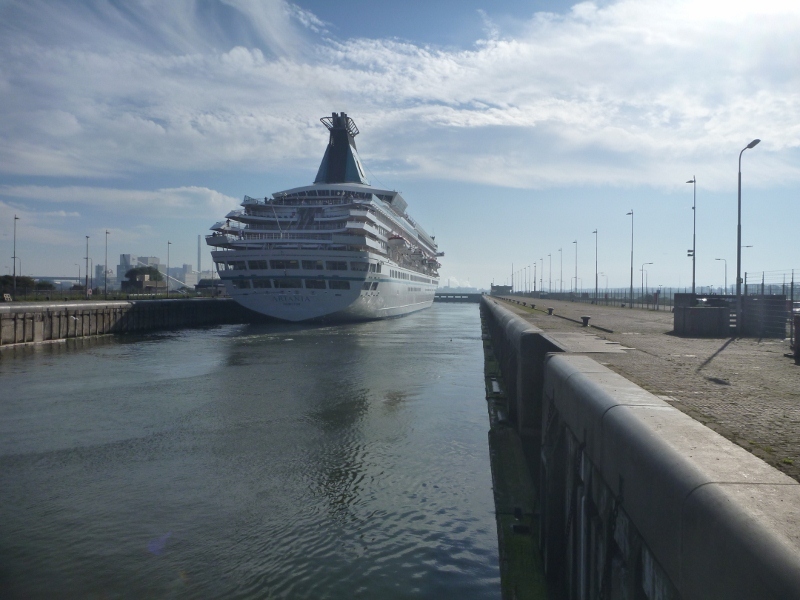 As we arrived there a cruise ship was just entering the locks on its way into Amsterdam. There were three locks side by side that catered for a variety of sizes of vessels so we had an interesting ride over all three. Ijmuiden is where Holland has its great steel mills and cement works. They were working 24-7 and billow out copious quantities of white smoke which we could see from miles away. Around the northern side of the mills on the road to the beach are some steel sculptures in the dunes. On the return ride we found the cycle way that wove in and around these. 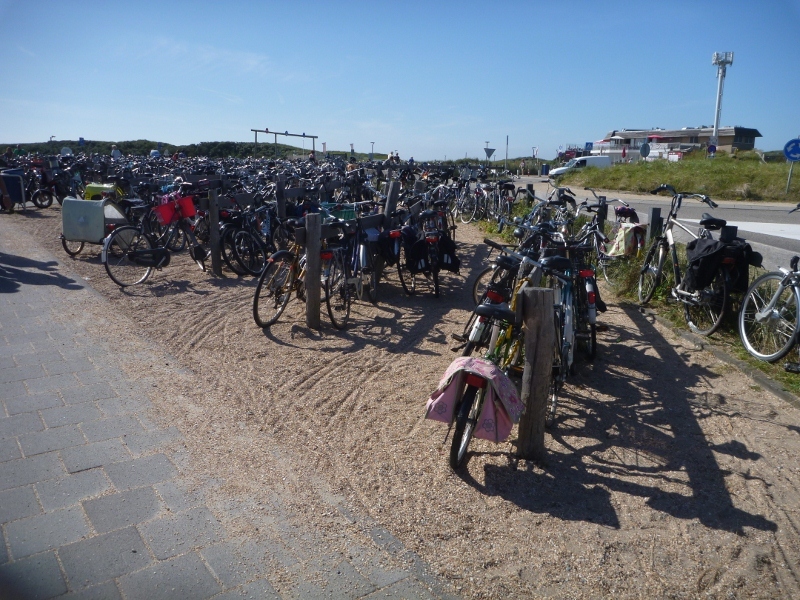 This is the bike parking area mid morning at a beach in Holland! After crossing the locks we joined the crowds of people who were making their way to the beaches for the day. Riding through the dunes was very pleasant. 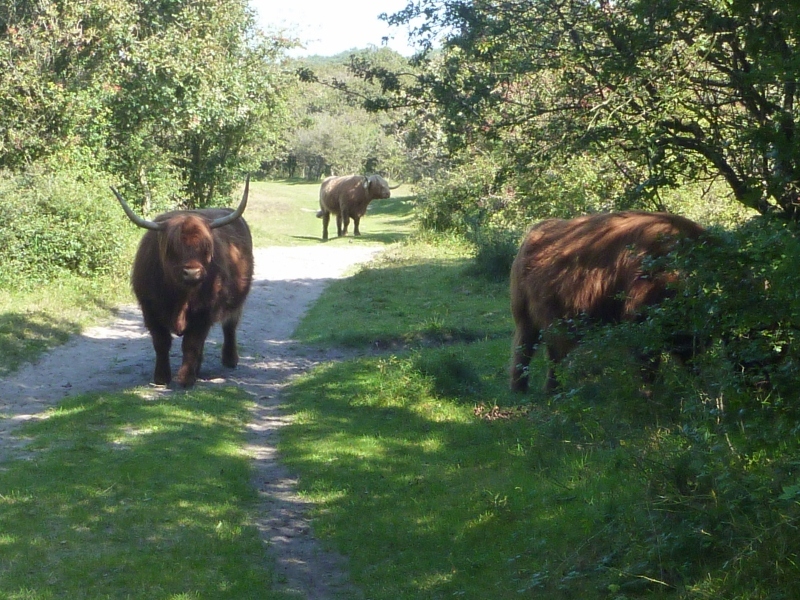 We came across another herd of the Highland cattle they have in the parks here. These dudes just kind of gate crashed our picnic! Scottish Highland Cattle are now often seen in many of the parks here. Just before we got to Zandvoort we turned east towards Amsterdam and found our way through to Piet Heyn and Liesbeth’s summer house on the Nieuwemeer. Nieuwemeer is a large lake that borders the polder that Schiphol airport is built on. We had a catch up with them and then had a cruise around the lake on their boat. After we left the lake part we had a short cruise down the canal and passed quite a few house boats. The water ways were very busy with boats and people swimming. It was a lovely way to spend the late afternoon relaxing and then we returned to the Amsterdam house after we collected the keys. Altogether we covered close to 400kms for this ‘warm down’ tour. Now its back to cleaning the gear again! Yes, we are on the way again. It was good to have a long weekend with the family in Amsterdam and tell some stories and hear how they were. We walked to and through a market and found it hard to get used to the crowd on Saturday. We cleaned the bikes and decided to use them again to visit the family in Amstelveen instead of using the tram on Sunday. We got a cable replaced on one of the bikes on Monday and had to leave it there for a day, so we hired a bike to pick up the Eurail pass from DHL, which we had already successfully used. We then met a Canadian couple on tourbikes with packs by a McDonalds on the way and heard their stories about their 10th trip in Europe on bikes. They agreed, that once you are biking around and seeing the details of Europe you just can’t stay put in one place for too long. Because we talked to them we had to rush back on the bikes to return the hire-bike in Amsterdam from the other site of the airport. By Schiphol we crossed the path of this Jumbo-Jet. We had already quietly planned an easy trip through the North-West of Holland so off we went on Tuesday morning. We negotiated the traffic hazards of Amsterdam centrum. Did not get noticed by any waiters at the coffee-culture Leidseplein on the side where we were able to park the bikes, so decided to move on from one canal to another. Pushing bikes through roadworks, against peak-hour traffic (mainly bikes) occasionally even (legally) at the wrong side of the road. Via the Central Station bicycle-parking tower to a free ferry across Amsterdam Harbour. We had a choice of four of these all with queues of waiting bikes, so probably picked the wrong one and had quite a job to navigate in the direction we wanted. Then finally we found the way to Zaandam where I was amazed to see the canal where I had my first rowing race many years ago is now covered with flatblocks. 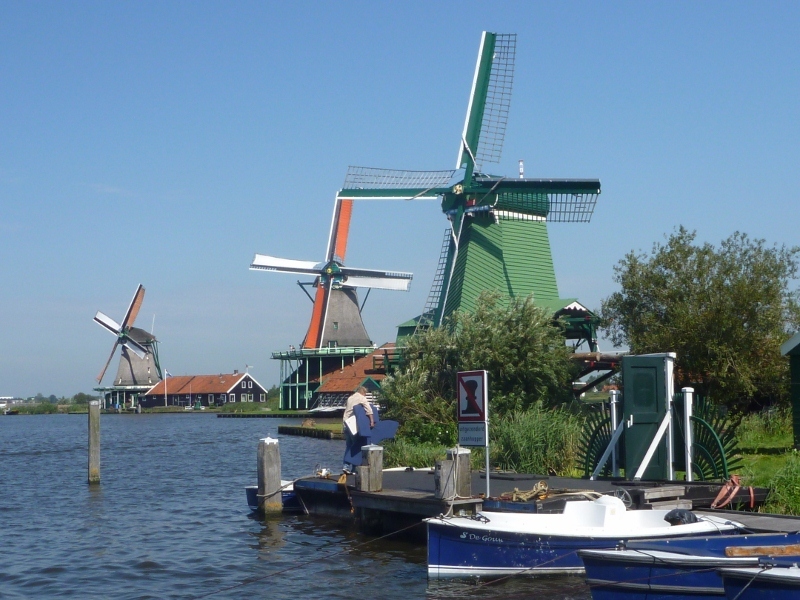 We emerged from this city madness to the quiet beauty of the Zaanse Schans where an old-style village has been nicely restored complete with a number of the old windmills, which used to power this area. Getting out of the big city always takes longer than simply riding, so we were hungry. The queue for the Dutch pancakes was too long, so we asked and found the way to a fresh bakery and this one was a feast to the eye and nostrils. We made our choice and ate some of it immediately on a seat in front of the shop with a couple from … the Kapiti Coast, which we met in the same shop. From there we rode towards the east through the picturesque polderland (under sea level) of Holland towards the coast of the Ijsselmeer, which has been partly saved from reclamation. 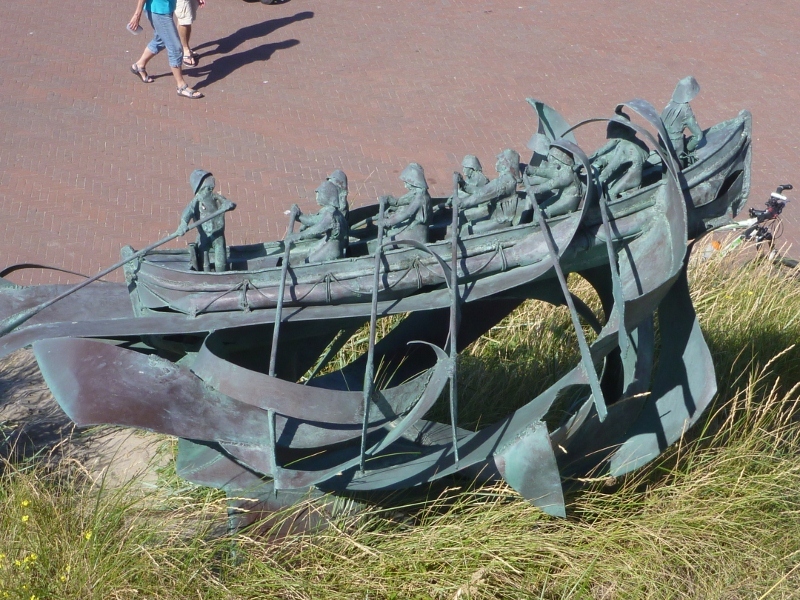 The protest actions have saved some of the traditions of flatbottom old Dutch boats as shown below. 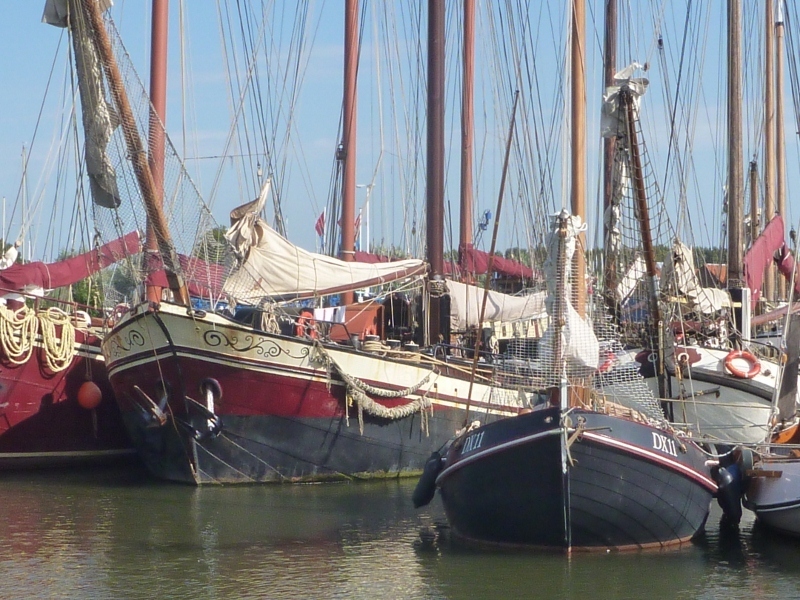 Flatbottom ‘Tjalks’ and ‘Botters’ in Monnickendam Harbour. Fishing/sailing boat originally use on the Zuiderzee, which was diked in to become Ijsselmeer in 1950. 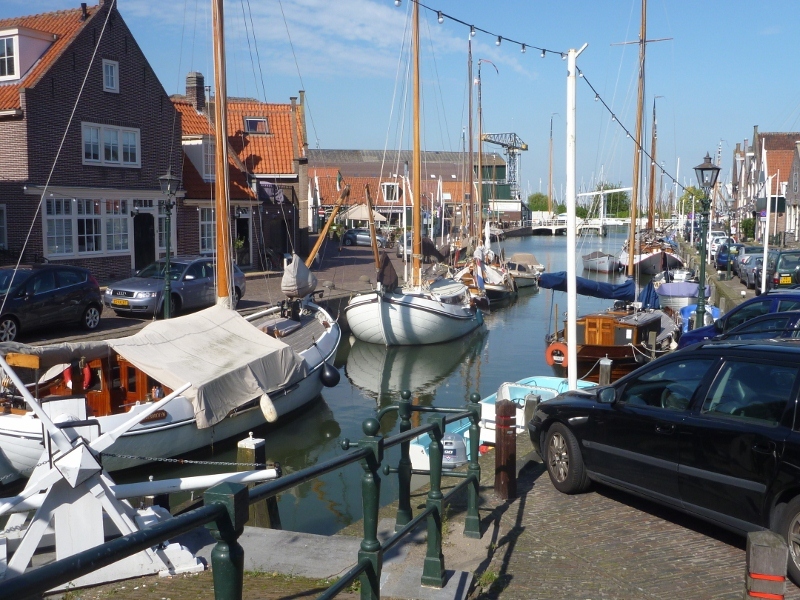 We found out from the Info-office, that we could still reach the off-shore island of Marken via the causeway in time to catch the ferry from there to Volendam. Both these places are well-known for their traditional dresses, now mainly worn for tourists and on special days. Just north of Volendam we reached the town famous for the Dutch cheese under the name of ‘Edam’. We found a nice camp-ground overlooking the ‘sea’ (Ijsselmeer) and slept again just as well in the tent as we had in the ‘proper’ bed in Amsterdam. Typical Dutch scene on our way home. We had a wet start to the day so delayed leaving the camping until it cleared a bit at midday. It was a nice ride back although we were battling a strong headwind all the way. By the time we got to Amsterdam it was late afternoon and we were quite tired. We got ourselves cleaned up and went and had a very nice meal with Piet Heyn and Liesbeth. We did a bit of weighing of our gear and I had carried 25kgs of gear in the bags on the bike which is about 14kgs. I had lost about 6kg in weight during the ride. Now very few of the clothes I came over with fit! Roel had a much heavier bike(19kg) and carried 26kg in gear. He also carried most of the food so the weight varied a bit as we travelled. He has also lost about 5kg in weight although he didn’t have any excess to loose! During the ride we had one puncture to Roel’s rear tyre, replaced the chain on Roel’s bike and he used two sets of brake pads. 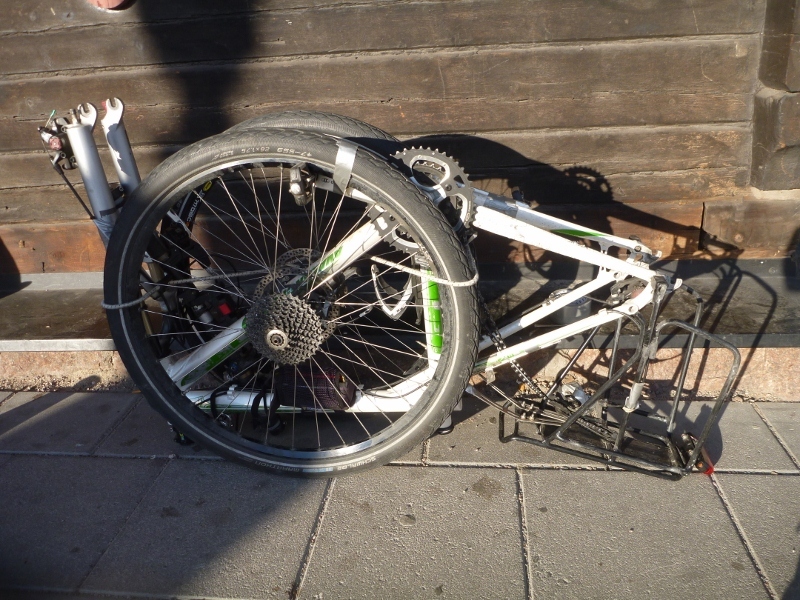 Roel also broke the front pannier rack which we repaired at the time with wire and duct tape. I had a front gear cable replacement. Both bikes will need to have a good clean and other worn parts will need to be replaced but they have both been very reliable during the trip. We lost a couple of items – one pair sunglasses, both knives, and two polyprop tops. At this time we are planning a shorter multiple day trip sometime next week if the weather is good which will take us to the coast to the dunes and around a bit of northern Holland. Other than that we will just do day trips around here. I will be updating the blog so you can still follow what we are doing until we leave to come home. Back in the flat land…. We have kind of jumped a few days. Life on the road home has been hectic to say the least. Our experiences with adventure racing has got us through this stage intact! We have got ourselves to Stockholm and decided we could make a connection to Kopenhagen so we shuffled the gear across platforms and bordered the train. We popped ourselves into some seats and managed to explain our somewhat dubious Eurail pass to the conductor who wished us luck on the rest of our travels. After Getting to Kopenhagen we decided to see if we could stay the night at a hotel before carrying on the next day. Roel headed off in search of a suitable place that would also be able to pick us up and transport all the gear. No luck there! The next option was to find out when we could next get on a train going in the direction we needed to go. 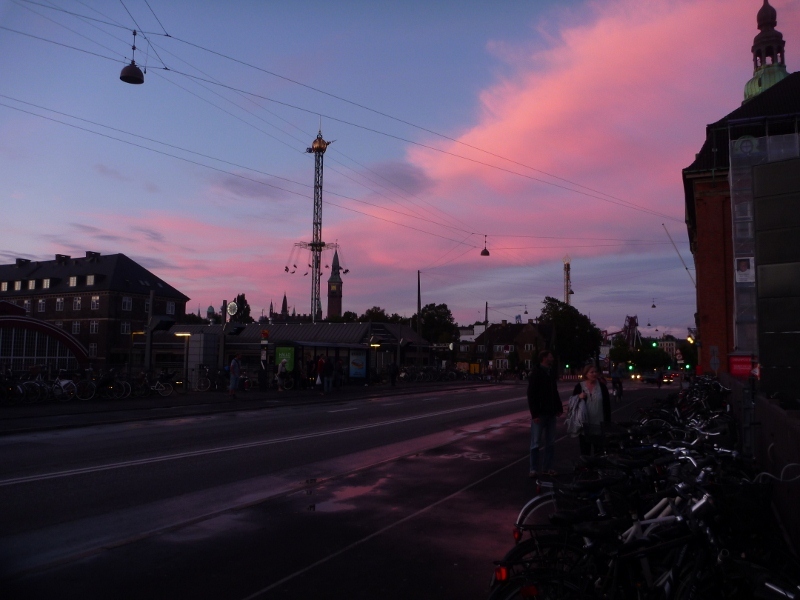 The sunsets over Tivoli Gardens while I wait for Roel to find a hotel for the night. There happened to be one at 10.15 to Nykobing down close to the ferry crossing from Denmark to Germany. So off we went shuttling the gear to the next platform….. you need to know this involved moving it about 50 meters at a time so that we did not appear to abandon any of it otherwise security people would get suspisious about unattended bags. Each change of platform, if we didn’t find a trolley, took about six goes! We arrived at Nykobing quite late at 11.30 and decided we may have to sleep at the train station. There were some people working in a new cafe at the station and they offered to take care of the gear until morning and advised us of a hotel about 800 meters away. So we took the valubles and headed off walking to find this hotel. There was a night receptionist and we finally got to a horizontal position at about 12.30. The next day we would need to be at the train station to get the gear and depart at 9.15. We had a breakfast included with the room tarrif and after a good feed we headed back on foot to the station. We met the guy who was building the cafe and collected our gear. We have got pretty good at getting the bikes and bags on the trains and soon were seated in first class on the ICE to Germany. There were warnings everywhere that this train didn’t take bikes but I think we moved so fast that the conductor had no idea how many bags were ours or what was in them. At the ferry the crew changed from Demark people to German staff. They too raised their eyebrows about our ticket but accepted it all the same. 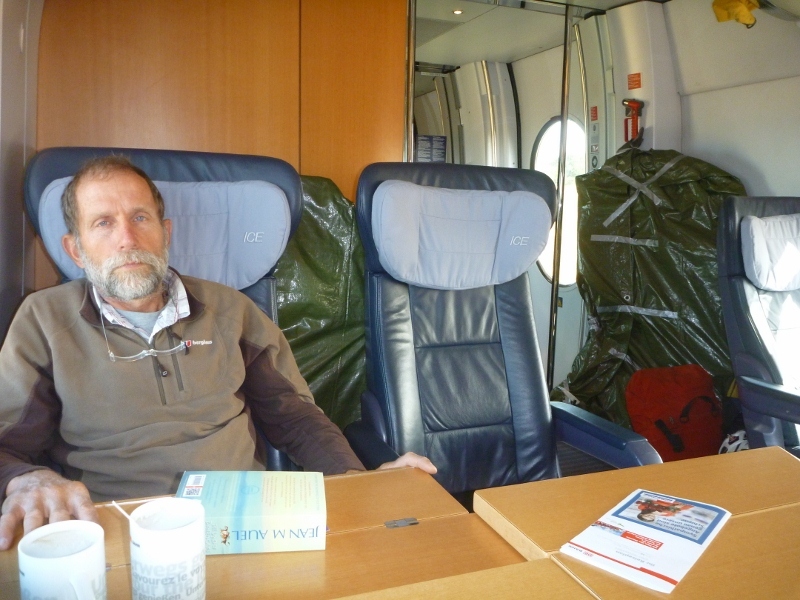 The ICE train took us to Hamburg and there we could catch the train to Osnabruck. It was supposed to be from the same platform but we ended up moving the gear from Platform 2 to 14. Roel found a trolley thing from some catering outfit and we loaded that up. I hope the caterers found the trolley eventually! 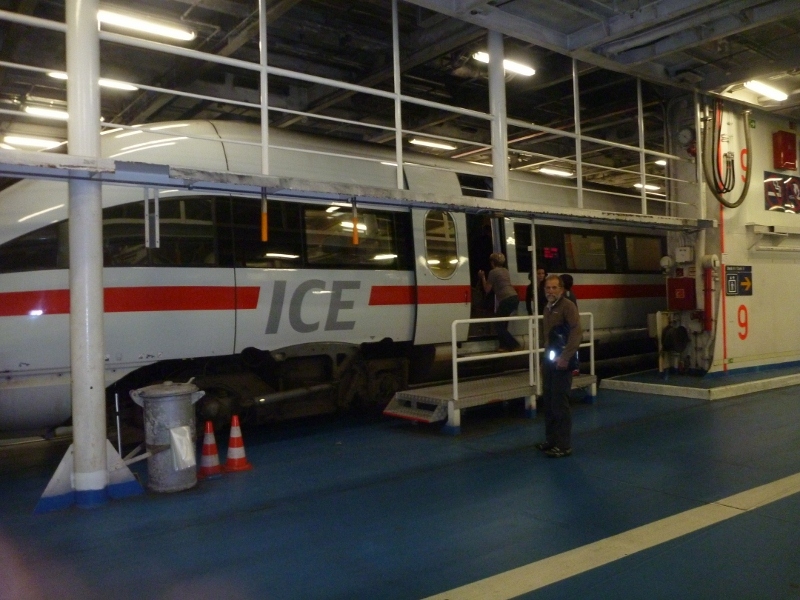 The train on board the ferry between Denmark and Germany. Roel sitting in front of the neatly stowed gear…. 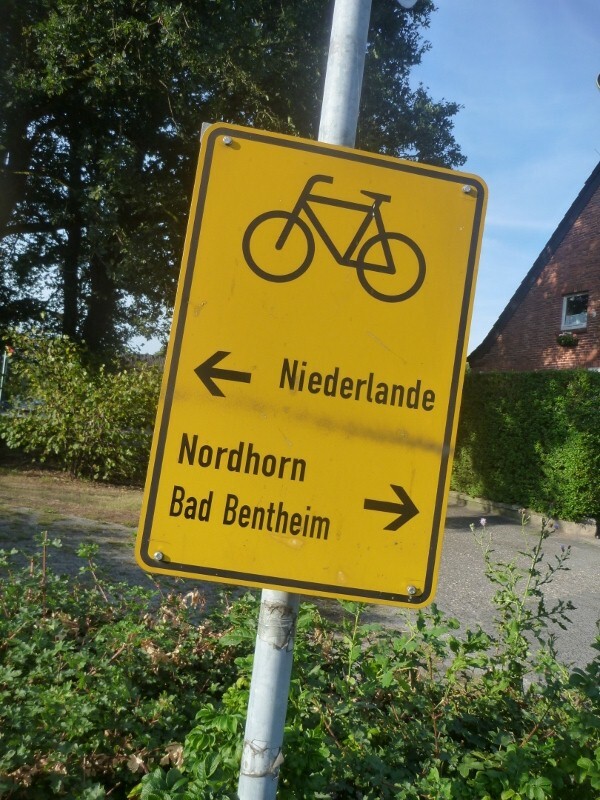 After arriving in Osnabruck we could get a local train to Bad Bentheim which is on the German side of the border. 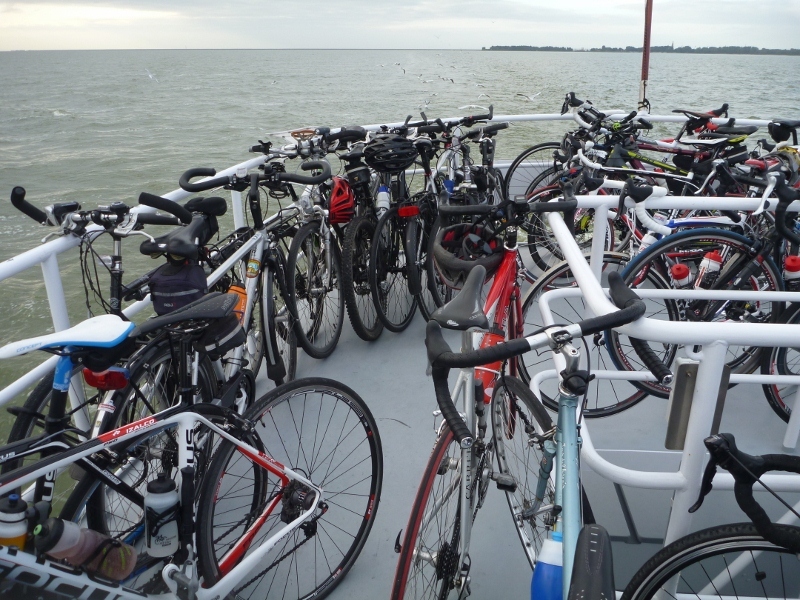 We then assembled the bikes on the platform so we could ride from there to Amsterdam. It was rather ironic that one of the departing train conductors got Roel to move his bike from some moveable steps as they were required for the train departing to Amsterdam. We rode from the train station at about 5pm and crossed into Holland not long after. We had a nice meal at a restaurant before riding off to find a campsite for the night. I had read about some nature camping sites and so when we came past a direction to one of these we decided to see if we could pitch the tent there. When we got to it there were three paddocks with caravans and tents. Not quite what I thought we would find but we set up camp and settled down for the night. Apparently we needed some nature camping card (which we didn’t have) but we left early in the morning so I guess it didn’t really matter. Today we got on the road early and had breakfast after purchasing yoghurt at a small village cheese shop. We planned to visit Roel’s cousin Karel and Anja later in the day but we had a good distance to cover to get to Zutphen. We had to backtrack about 5 km because the camping was much further away from our route than we had thought. 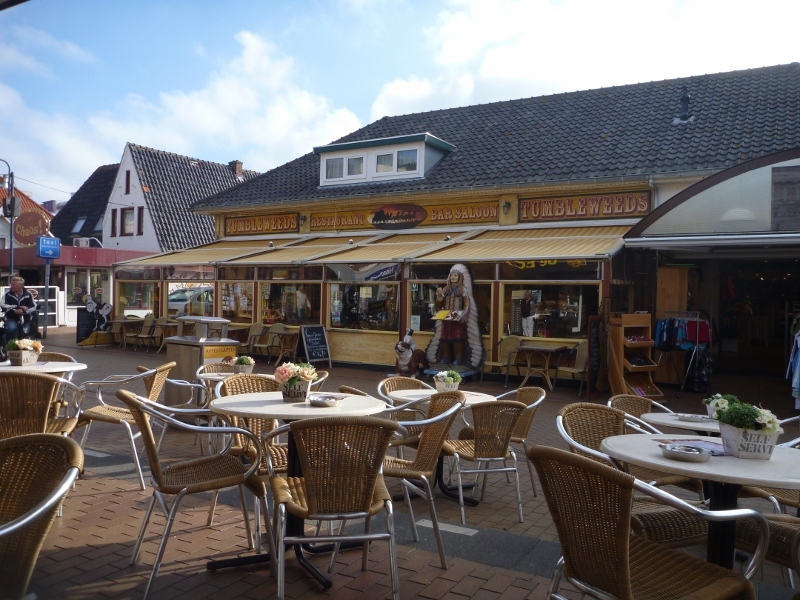 We had breakfast in Oldenzaal at a town square with our usual combination of yoghurt and muesli. We were running low on water, so we called in at the local pharmacy who looked a bit strange at the request, but when we explained that on our type of trip you can’t always find the public toilets and other necessary conveniences of life. Generally people are quite interested in what we have done. 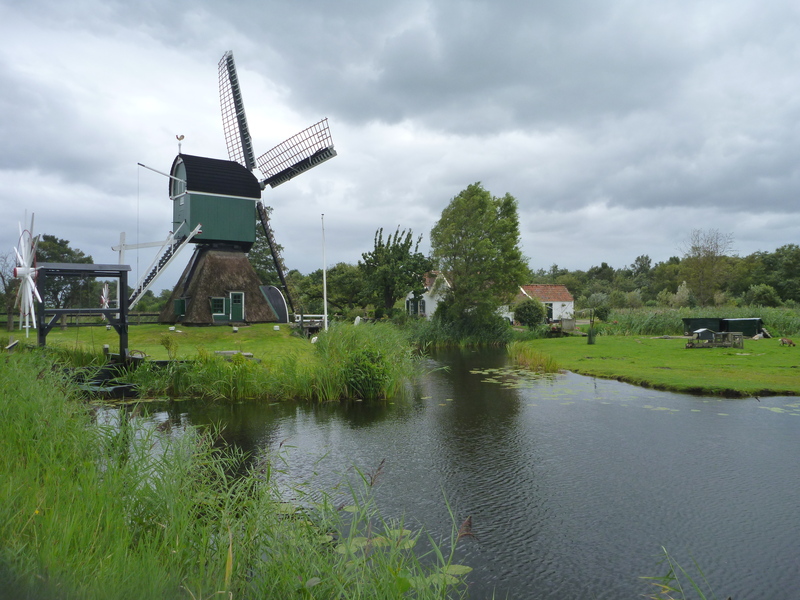 For example we had lunch at a nice terrace overlooking a watermill with three paddlewheels driving two mills, dating from 1548 (!). 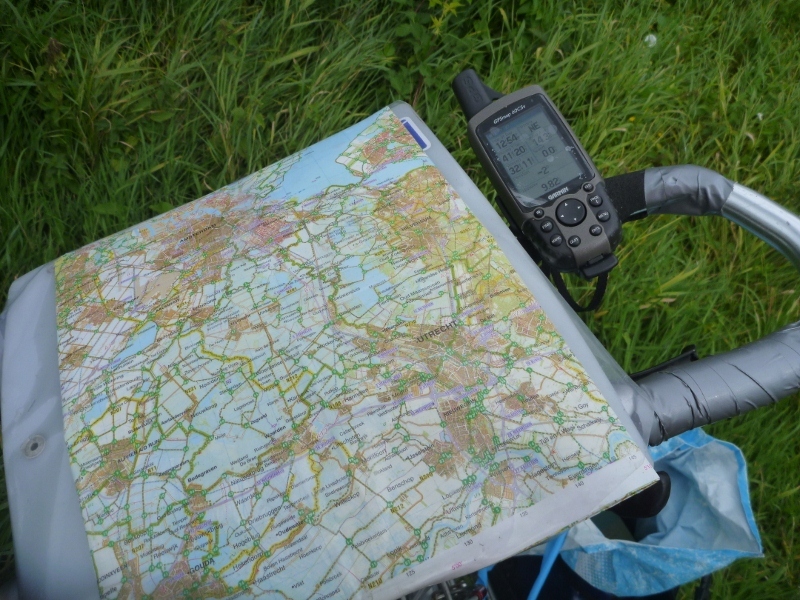 The people on the next able asked how far we had come and almost choked on their lunch at the answer: about 4000 km. We had to explain and they were even more surprised to hear about the electronic equipment we are carrying: two laptops, GPS, two cameras etc. So we got to talk about modern technology. 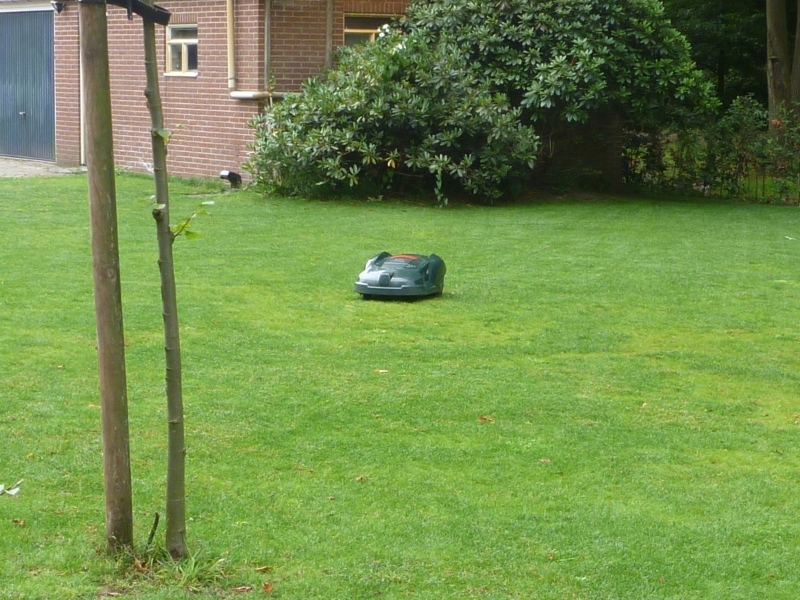 We had been baffled by seeing a robot-mower for the first time. This relatively small Husquarna (sewing mowing machine?) was quietly mowing away in straight lines on an oddly shaped lawn, which looked cleanly mown anyway. When it bumped into a hedge or on the driveway it would back away a little and turn itself about 30 degrees and carry on. Fascinating. We assumed it was quite expensive. The guy on the next table guessed it was about 500 Euros. It turned out, that the waitress who had served us actually lived at the house. She revealed, that the actual price was 2000 Euros (about NZ$3500) and that it operated 24/7 and reloaded itself when the battery was flat. Unbelievable and the lawn was relatively small. I know lots of people (including myself) who would be happy to do the mowing job on that size lawn for a few years for that kind of money. 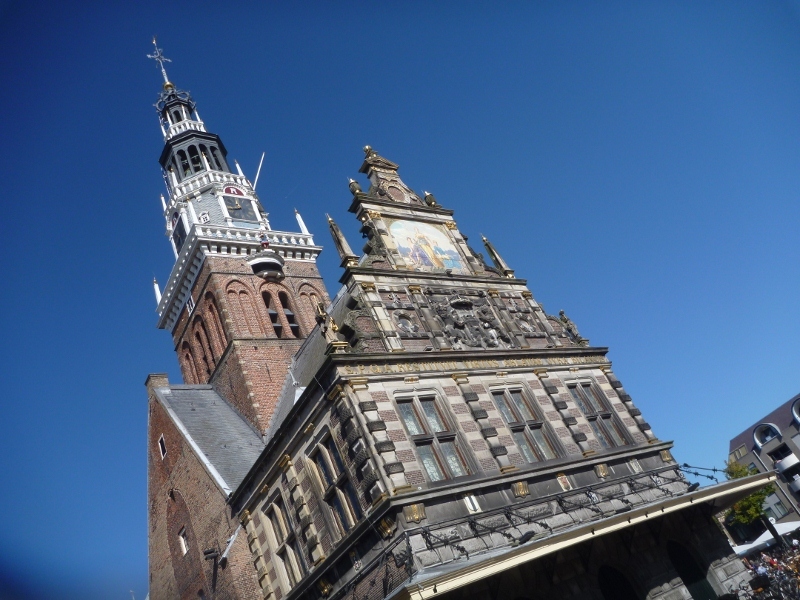 Zutphen is on the Ijssel River and Karel has a house that overlooks the river and that has been in the family for many generations. It is a huge house which has undergone several rebuilds including one after WW2 when the Germans had occupied it. They invited us to have dinner and stay the night which gave us time to have a really good catch up with all the things our families are up to. A great night of fun together and a highlight on our trip for both Roel and I. We left Karel and Anja at midday after a nice sleep in and a super breakfast. We are traveling through a scenic route over the national parks to get to Amsterdam. 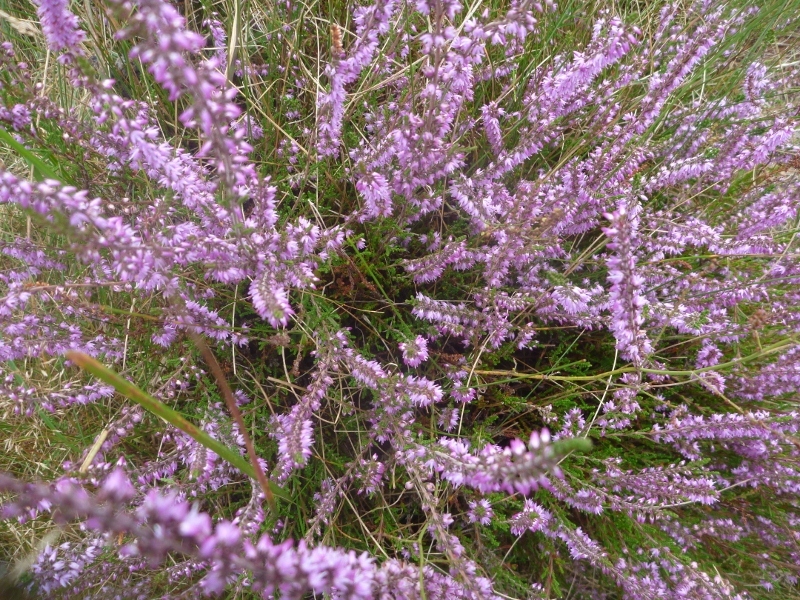 These are often wide open areas of heather which is now flowering so Holland looks like it has a purple carpet laid over it. If the countryside is not heather we are in some really nice forest patches. 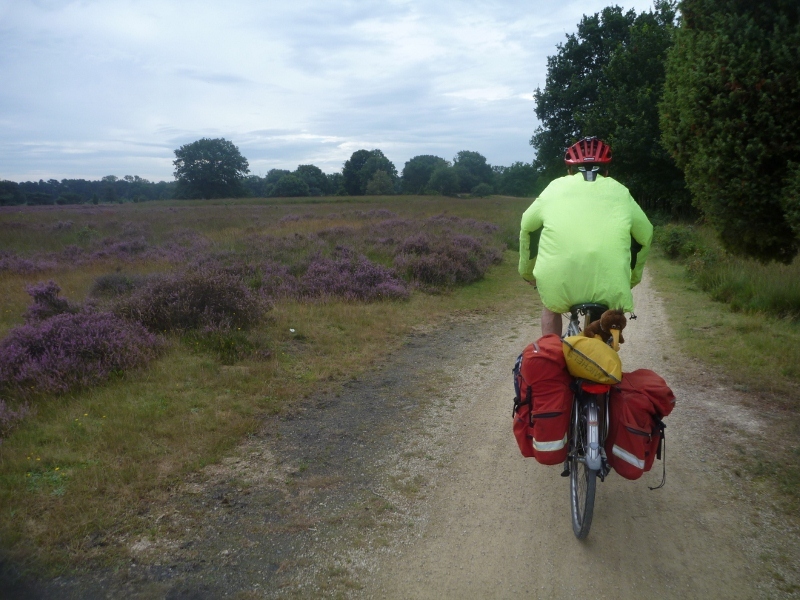 Roel riding through one of the areas of the park with lots of heather that looks like a carpet. A close up photo of the purple plant. We had a couple of ferry crossings too which are a lot smaller than the ones in Norway. Today the weather has been sunny and warm so there were lots of people out on bikes touring through the parks. We had a coffee stop at Bronckhorst which is an old village with a focus on Charles Dickens. The cafe was a good opportunity to have my regular coffee and appletart! The ideal roading for bikes. 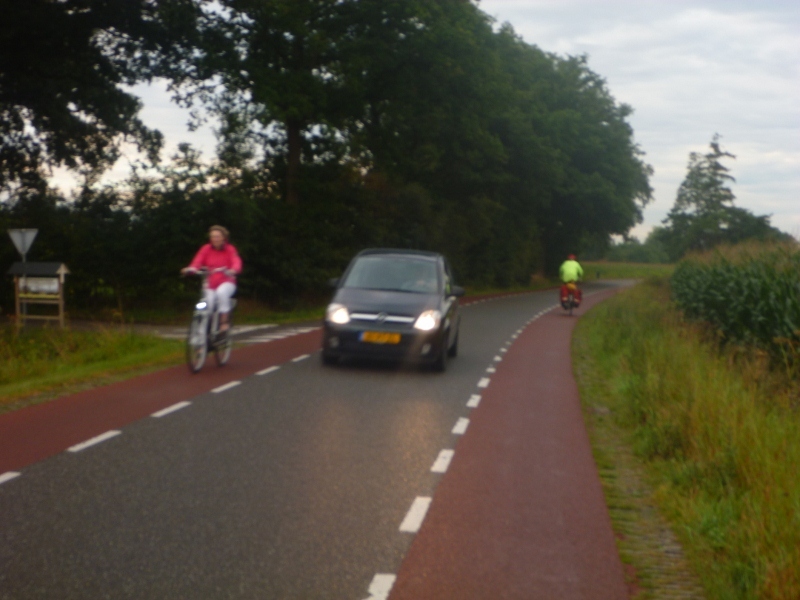 This is a two way road – the cars have to fight over the bit in the middle! 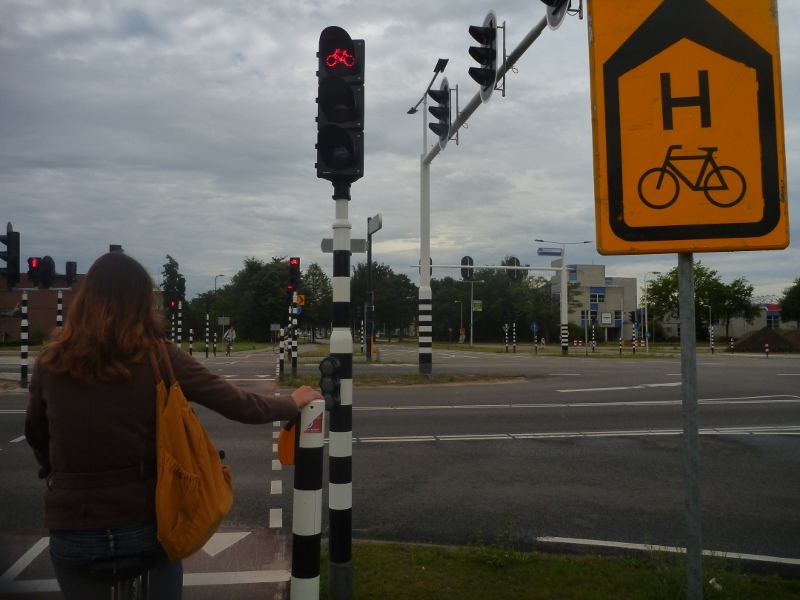 At intersections bikes have their own set of lights too…. We have now got to a camping ground just out of Arnhem and are having a beer while we type this up! 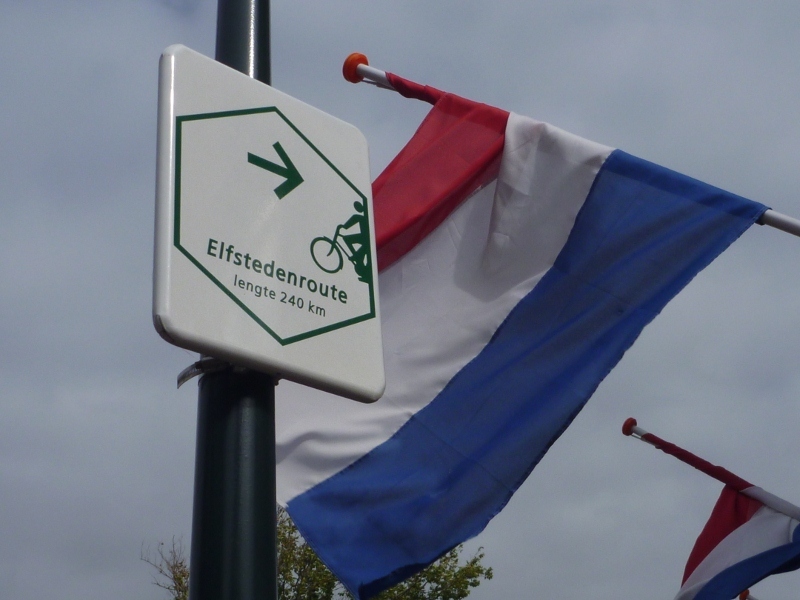 We have continued on along the scenic bike route and are camped between Utrecht and Hilversum. Although we have covered 97kms today we still have about 4 hours riding time to get back to Amsterdam. It has been a beautiful day here and Roel and I are enjoying a slower ride back through the National Parks here. There is an outstanding cycle network with numbered intersections. The way we are travelling is by selecting a series of the numbered intersections along the route we want to travel and then going from one to the other. It is a kind of join the dots on bikes. It has worked extremely well unless we have encounterd road works that prevent is from following the signs in which case it becomes a bit of a lottery if we get back on track straight away. 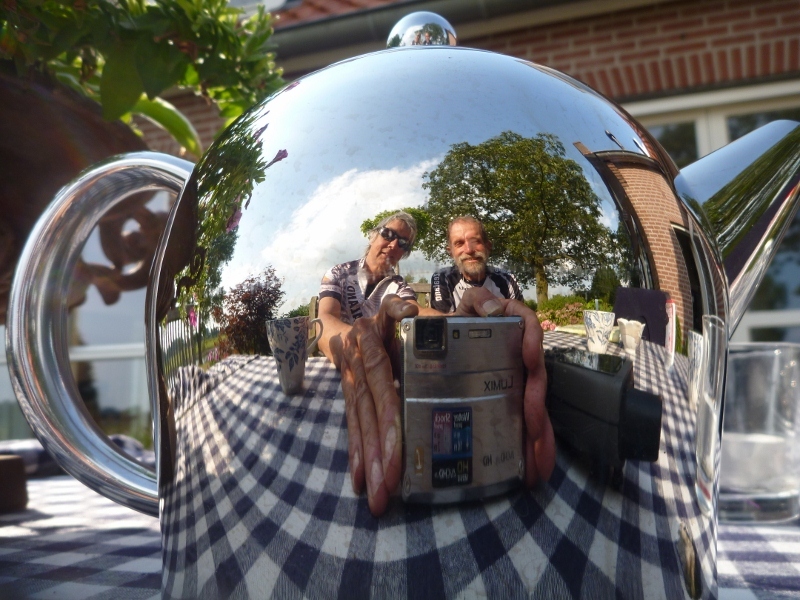 Tomorrow we should be back in Amsterdam by early afternoon and then the cleanup starts….. We will keep maintaining the blog until we are leaving for New Zealand (19 September) or maybe even after that if the trip home is worth mentioning. I have included a few images here from yesterdays ride. Today we have started off in the wet again and the temperatures are really cold. We had the wind in our faces to start with but as we shifted direction to the east again we got a bit of relief from the “icicles in the face” when the wind came from behind us. We had a long bridge to cross again this morning but the nice part was a cafe on the other side where we took some shelter. A German tourist bus was preparing to leave and we both offered to swap seats with some of the passengers. No surprise…. no one took up the offer. After taking this break the weather looked a little brighter in the direction we were heading so we departed in a light drizzle along the coastal side route. The more we continued on the less rain we had which allowed us to stop at a small village for lunch. We originally found a picnic table at the school that we thought would serve the purpose well but then realised that the school would also have their lunch break to and we would end up with all the kids around us so we shifted to the wharf. It was a bit exposed to the wind but we found a sheltered corner to boil the billy. When the school had their lunch break, it turned out, that they only had about 10 students there. The view from from our lunch stop. 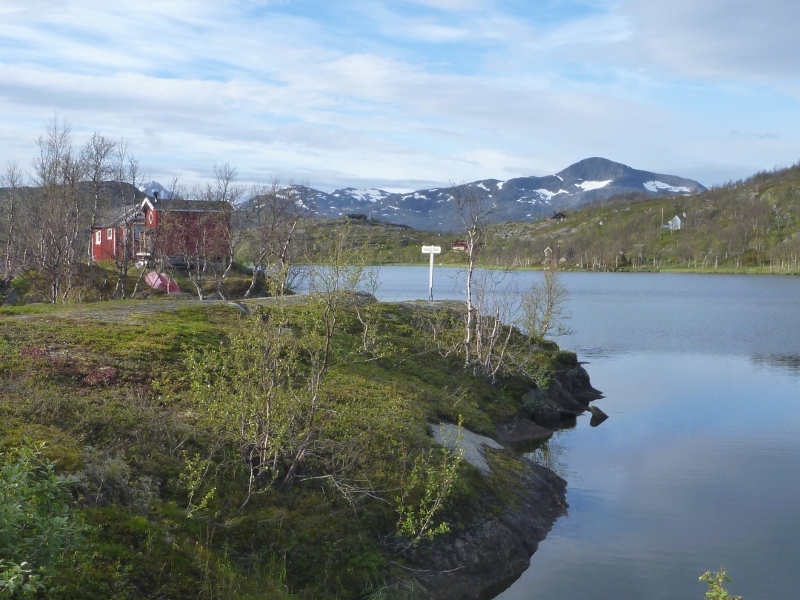 While the weather had dried out we decided to continue on towards Narvik. We were both riding well and felt it was a good idea to get as far as we could while it was dry. We had to join up with the main road again and ride with a bit more traffic and to descend a tunnel to get to the camping site for the night. As we circled around the Ofotfjord adjacent to Narvik we came past a memorial to the WW2 Battle of Narvik. The Germans had seen Narvik as a valuable site to set up their defences and after a prolonged attack the allies were able to liberate the town. There were lots of casualties. There are several large panels in the area that describe what happened in several languages. By the time we reached the overnight camp we had covered 110km. Not bad considering the terrain we are riding in! One of the last images from Norway just before the border at about 400meters and very cold still. This will be our last day in Norway. We have 27kms to ride to the swedish border which is uphill to Riksgrensen. The train departs there at 10am so we got away early as we had no idea how far we had to climb and we are pretty slow going uphill. As it was we arrived at Riksgrensen shortly after 9am and decided to check the depature at the station before making a coffee. Just as well we checked as the train was to be replaced by a bus! This was the start of a rather ‘seat of the pants’ day. 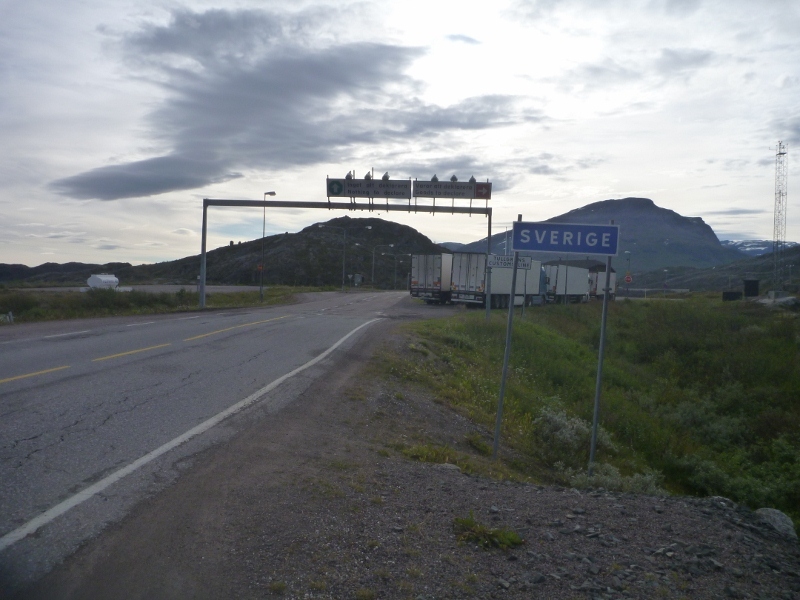 Crossing the border into Sweden. Most of this place was shut for their (normally winter) season. We finally found a hostel with someone in it who told us that yes, there was a bus, but no they don’t take bikes. In fact she told us that as a matter of course you can’t take the bike on a train in Sweden. Roel rang the train company in Stockholm and they told us that the bikes had to be in bags to go on the trains so we will have to pack them up. At 10am we wandered down to the bus stop and the driver agreed to take us as far as he could with the bikes but we would have to get off if he needed the space for luggage from other passengers. We agreed with that and he got us to Kiruna, about 130kms down the road. There was heaps of people waiting here so the driver ordered another bus to come. As Roel and I made coffee in the train station this other bus turned up for the 2.30pm run to Gallyvarre. He offered to take us as his bus was not so full. Things are going well! We got in to Gallyvarre and noticed the over night train to Stockholm was departing at 7.30pm which gave us 2 hours to pack the bikes into bags we didn’t have. 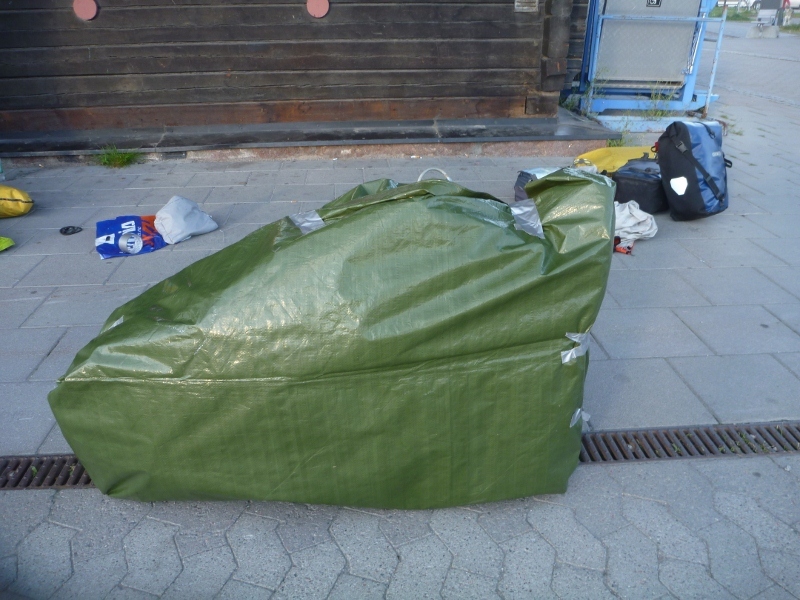 The hotel across from the train station kindly gave us some rubbish bags (the train company didn’t specify what type of bags the bikes had to be in) and we got some duct tape from the service station. Back on platform 3 we dismantled the bikes and eventually packed them into the tarp we have been using as a ground sheet under the tent. Roel busy packing his bike up. My bike pior to gift wrapping it in the tarp. Now it doesn’t look like a bike! During this procedure we had a bit of an audience because people that know weren’t so sure we would get away with this. When the train turned up we threw on our bikes and 9 separate bags and clambered aboard. Whew!! So now we were on our way to Stockholm. We had to sort of repeat the performance of shifting all the gear to another train at Boden which was a mad dash across a platform this time. The conductor checked our pass and noted we didn’t have a reservation so he wished us good luck and handed the pass back. We are not too sure why he wished us good luck but we haven’t been kicked off yet. Once we get to Stockholm we will decide how to continue from there. It sounds very messy and to a certain degree it is but Roel and I think of it as just one of those things you have to deal with in adventure racing sometimes and it just seems to sort itself out. 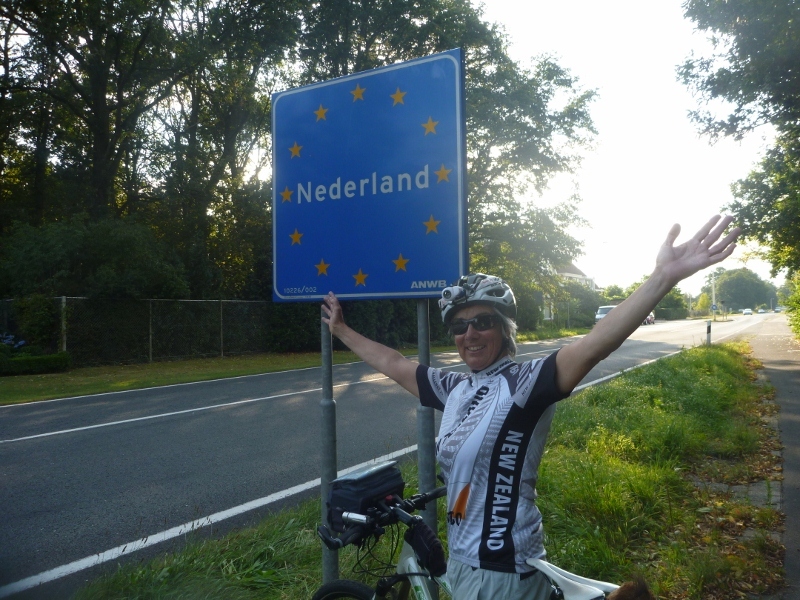 Now the bikes are packaged we will continue non stop to the Germany – Netherlands border and reassemble them to ride the last part across Holland. 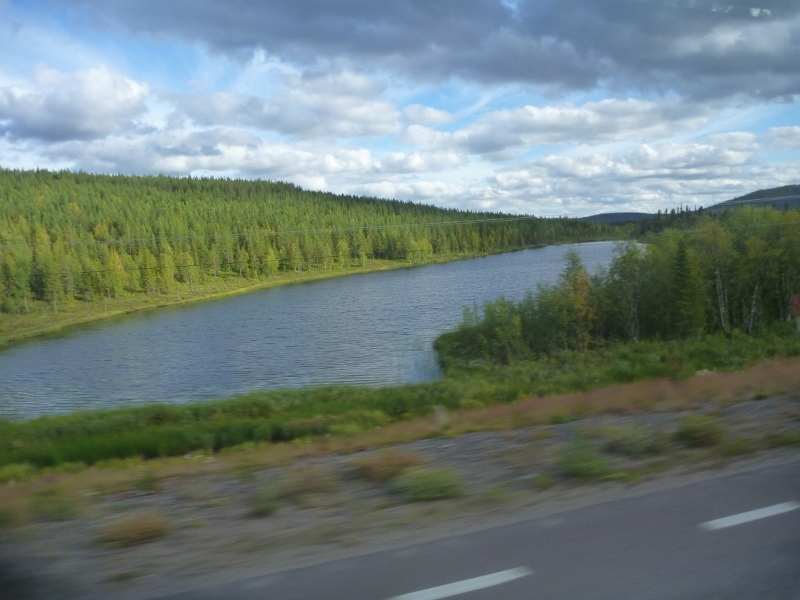 Sweden has hundreds of flattish miles covered with lovely lakes and ‘Christmas’ trees. Sweden is very flat compared with Norway. Once we crossed the border it just sort of gradually flattened out and is just wilderness with nothing but pine type trees. As we have got further south the towns have got bigger and there are more of them. It is odd covering the same distance in 24 hours that we have spent the last 4 weeks pedaling! 68 degrees north and cold! The weather forecast was for a nice and sunny day and indeed it was. There were some clouds and at some stage we felt a light drizzle and could see snow falling on the mountain tops with the icing sugar effect, but there was a lot of sunshine. Nevertheless it was the coldest day so far and the thermometer did not get far above 7 degrees. So, we were still riding with three or four layers including overpants, rain jackets and gloves. Perhaps we left it a bit late in the season to be above the polar circle. We reached Harstad today, which is 68+ degrees above the equator. 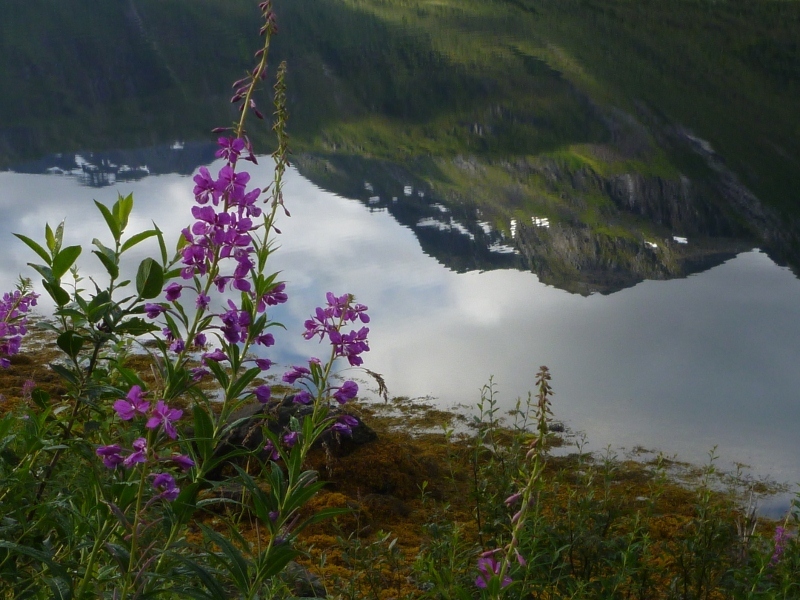 The schools have started again in Norway and we have been told, that if we wanted to go further north or see the midnight sun, we should have been here in July. And indeed, we have made the decision already, that this is our northern-most point. We stayed at the campground in Sortland and left from there with a nice downhill to the township itself. 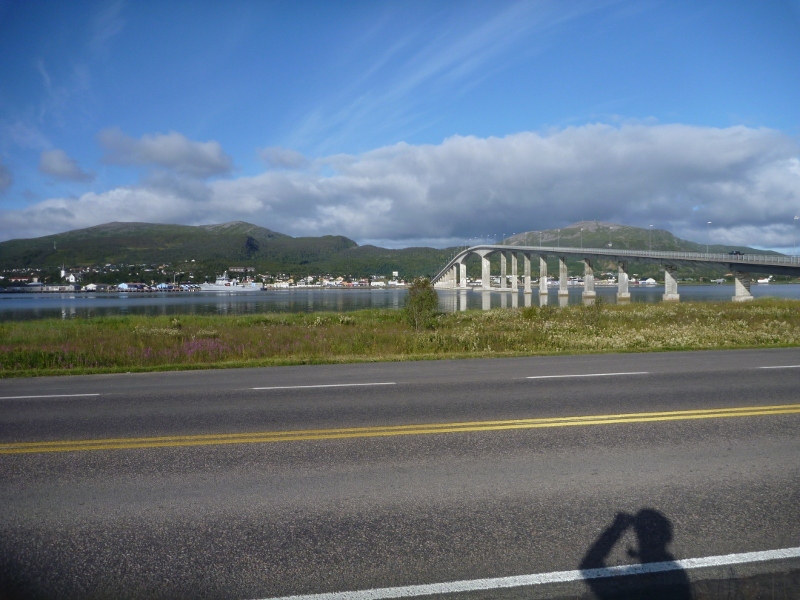 But then we immediately had to cross one of the largest bridges we have crossed so far, so we had a decent warm-up. We turned south along the main highway 85 until we had an opportunity to get away from the traffic and to avoid a large tunnel. The tunnels here are quite frightening, because they can be lengthy, steep and have little ventilation to control the fumes. But mainly the noise from the traffic can be deafening and often you are worried that some big truck is coming up behind you, while it is just the concentrated noise of a small engine car. Let alone several of those coming from both directions. The (for Norwegian standards little) Sigerfjord was very scenic with the typical old-style Norwegian houses. But today it was particularly beautiful, because the windstill day provided fantastic reflections on the clear water, whereas the bottom showed a variety of colours from seaweed, rocks and sand. We have seen quite a few sandy beaches in the last few days, but no swimmers or sun-bathers, although people do go diving here. We did feel sorry for the motorists in the tunnel who missed this scenery, but further on we had to join up with them again to continue along a nice lake, where we could not take our preferred old-road route on the far side, because it was still on our map, but had since been reverted back to shrub and farmland. After a quick unsuccessful attempt to fish a ‘keeper’ from the ferry-wharf we had a cup of coffee and then crossed the next fjord. Today we could see the tops of the mountains clearly, which were still as steep and rugged as in the south part the Lofoten. Here, however they are not as close together, so the postcard pictures are here a little bit further apart. Therefore we made better progress with riding and by lunchtime we had made much better progress than expected and already passed Vik, where we originally planned to camp. 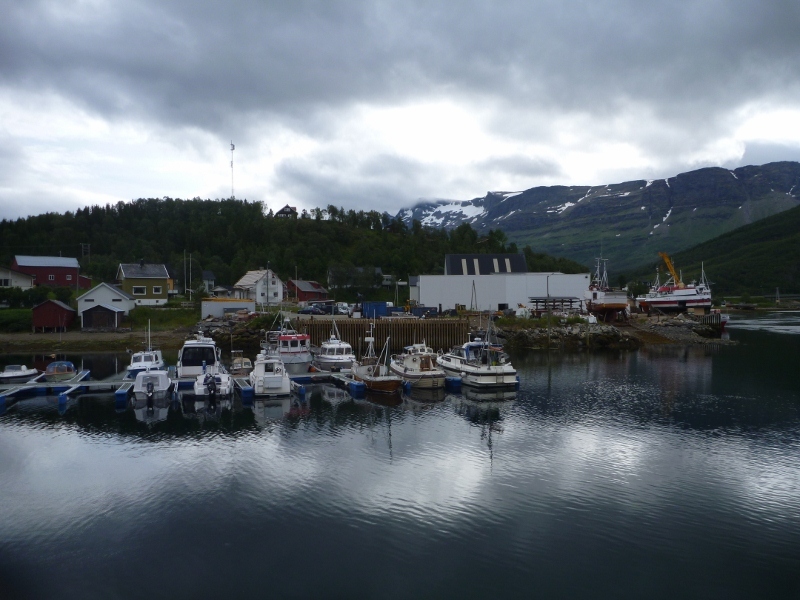 So we decided to move on to Harstad to try and sort out our return trip. We had to climb another 200 meters before getting there and that may not seem much, but at the moment we are taking turns with feeling the effects of 4000 kilometer at an average of 80 km per day. We arrived at Harstad at ten to three and expected, that the Information kiosk where we needed help may be closed by 3 pm. Fortunately they actually close at 3.30and we just happened to ask someone the way who was prepared to walk with us to the office. He then wanted to take our pictures and started to interview us about our tour so far and how we got to Harstad. It turned out we had made contact with a reporter from the local paper and he kept interviewing us in the tourist office, while we were trying to sort out our return trip. We did manage to book a Eurail pass for 5 days through 3 countries (Sweden, Denmark and Gemany) by 3.35 and have the confirmation printed at the office. The lady who was keen to close the shop forgot to charge us for the internet and printer use, so hopefully all is well. The plan is to do two days of train riding back through Sweden (a nine-hour and an 18-hour train ride) with a day off in between. Yes, Sweden is a big country and we have come a long way up north. Then we can cross Denmark and Germany in about 8 hours and perhaps call in at some friends on the way before getting back to Amsterdam for some rest and relaxation. We hope this plan does not fail, because the paperwork for it will be sent to Amsterdam (assuming that we do not start the journey for another week) and we have no idea whether we can actually take the bikes with the Eurail-pass as well. Anyway, we still have two days of riding before we get to Sweden and the forecast is for more rain. But there is light at the end of the tunnel and we are enjoying a good camp site just south of Harstad. We are starting to feel with some sadness, that the fairy tale in Norway might be coming to an end soon. But, it probably has been enough and there are many unforgettable memories. For the record: 78 kilometers today.